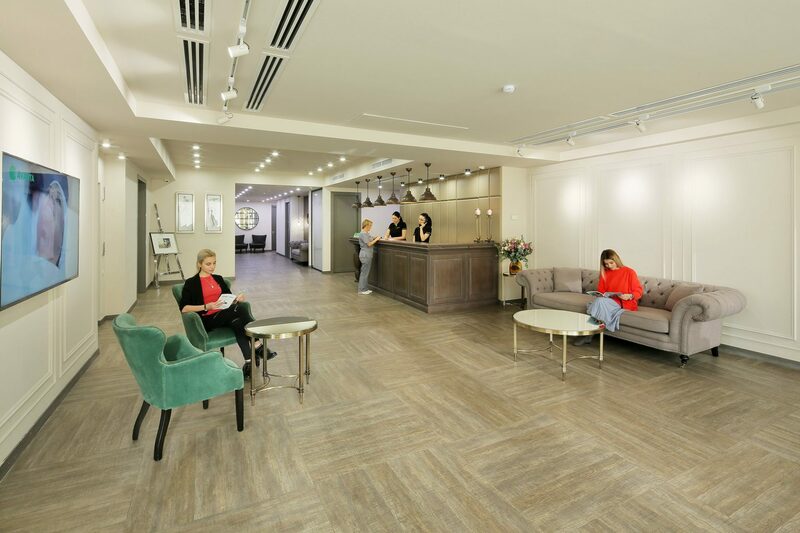 Delightedly we invite you to the virtual field trip through the multifunctional building of Avanta Innovative Medical Center. 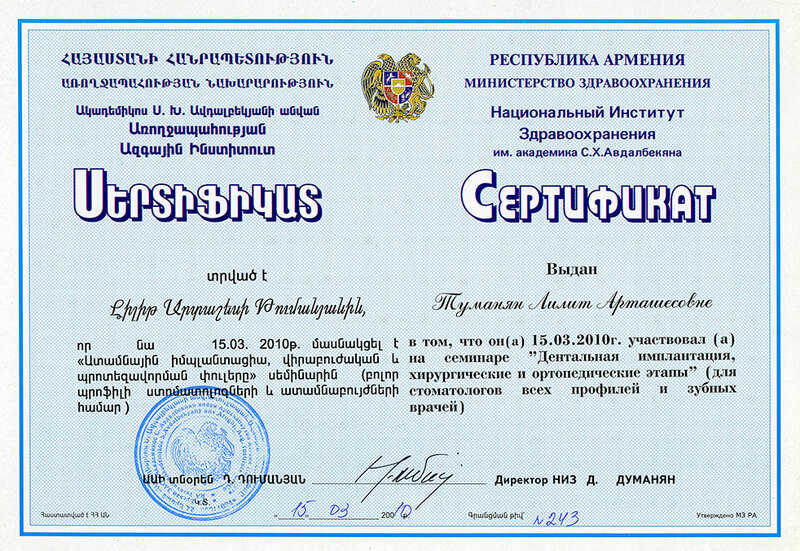 It was put in commission in 2017. 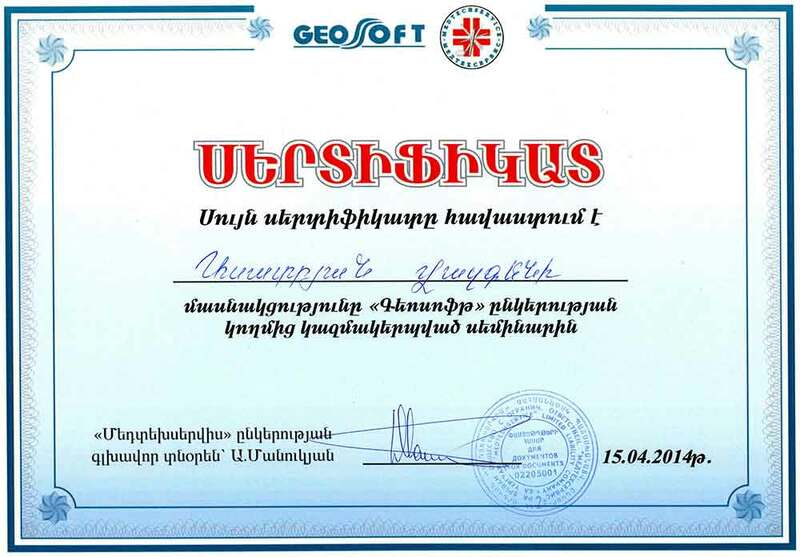 The design solutions of the building in the best possible way express the customer-oriented approach based on the long-term experience of the company founders Karen Grigoryan and Lilit Tumanyan, that is the provision of high quality and professional medical services under highly comfortable conditions. 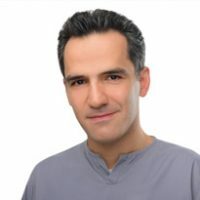 Dr. Pablo Naranjo at Avanta Innovative Medical Center. 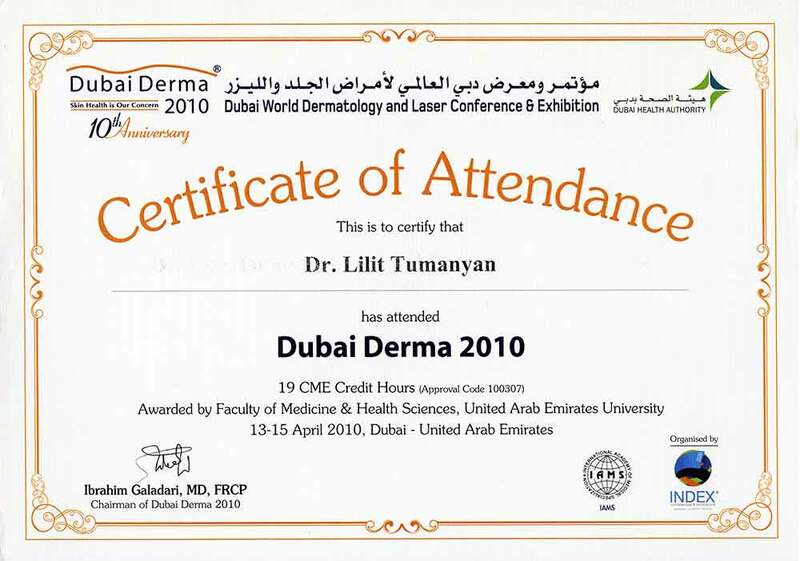 "For the past 15 years I've been working in the field of aesthetic medicine and I have managed to develop and introduce high technologies for a number of aesthetic and dermatological medical centers in the world. 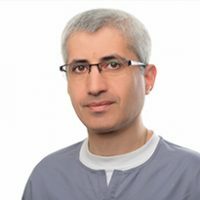 I can say honestly, that Avanta is one of the best clinics I have ever seen in USA, Canada, European and Asian countries, due to this atmosphere, all technologies implemented and of course due to the pleasant and experienced staff. 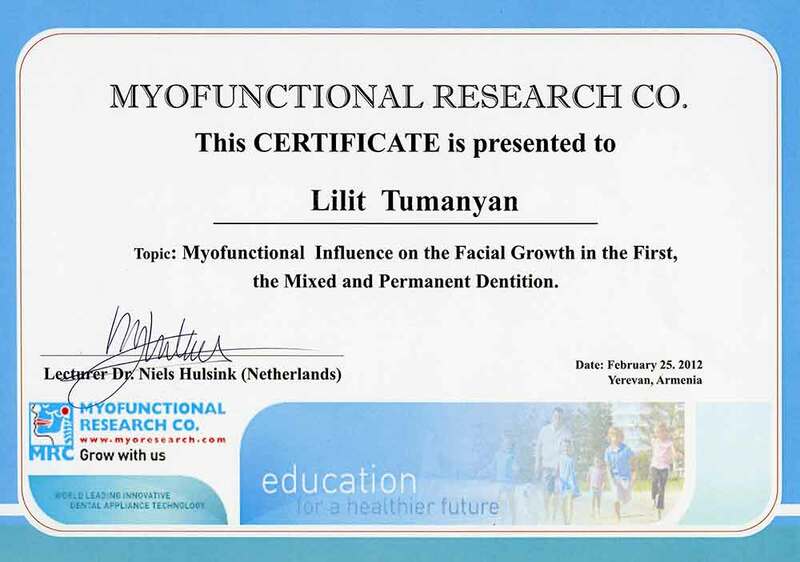 Now we are speaking about a really high quality clinic in the field of dentistry and aesthetic medicine". 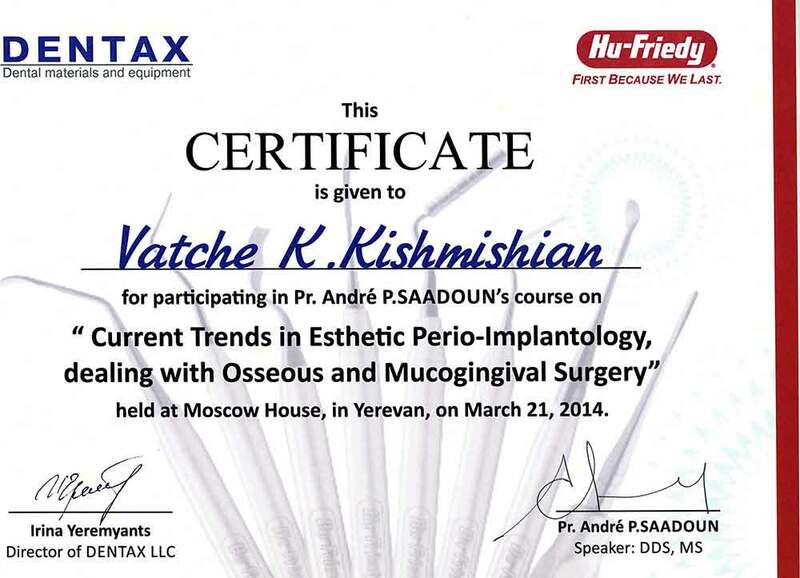 The famous Hollywood actor Alexander Leeb acquired his Hollywood smile at Avanta innovative medical center. 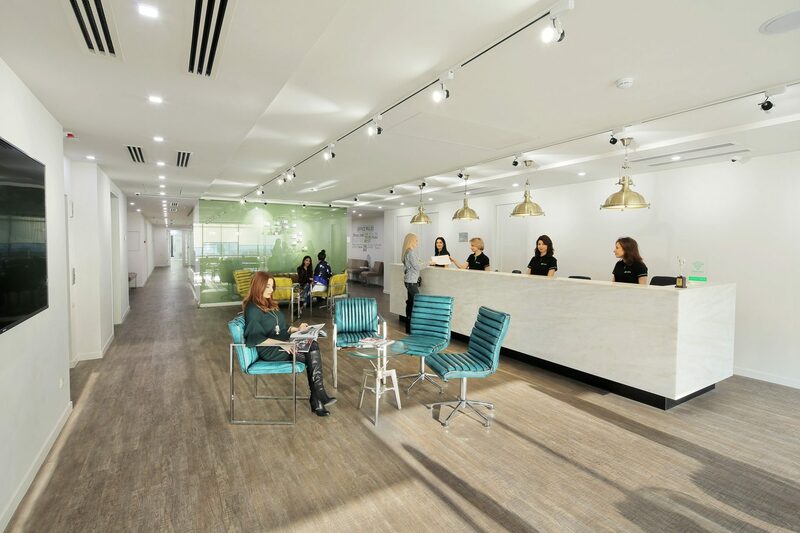 Here in Avanta it feels like a family, everyone is so kind and helpfully goes out of your way to help you. 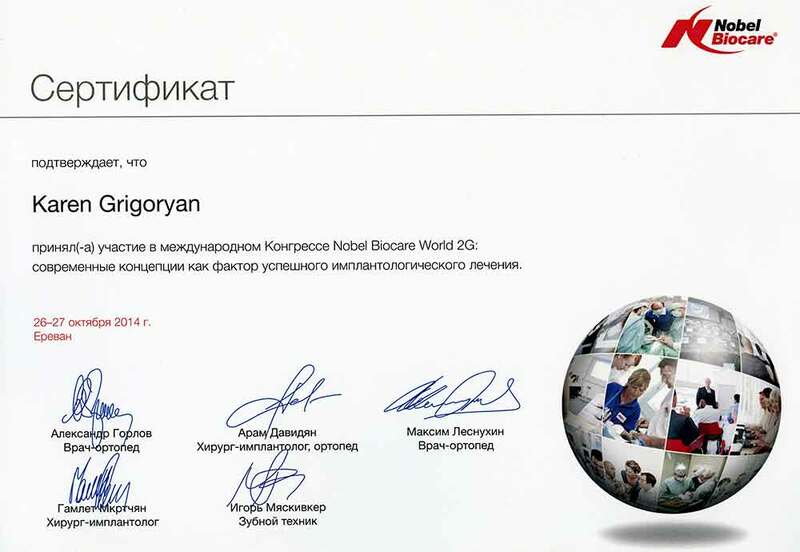 It's just a fantastic experience and I am very happy that I have found Avanta. 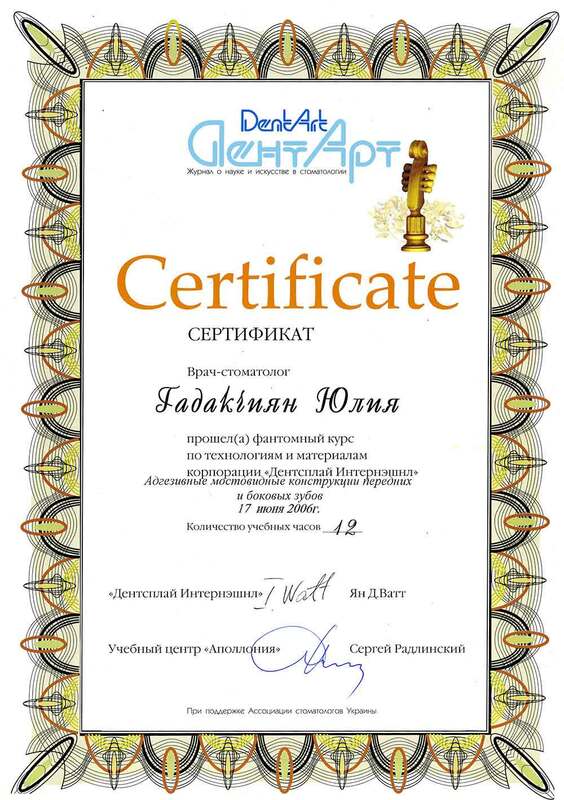 It is fantastic, thank you so much. 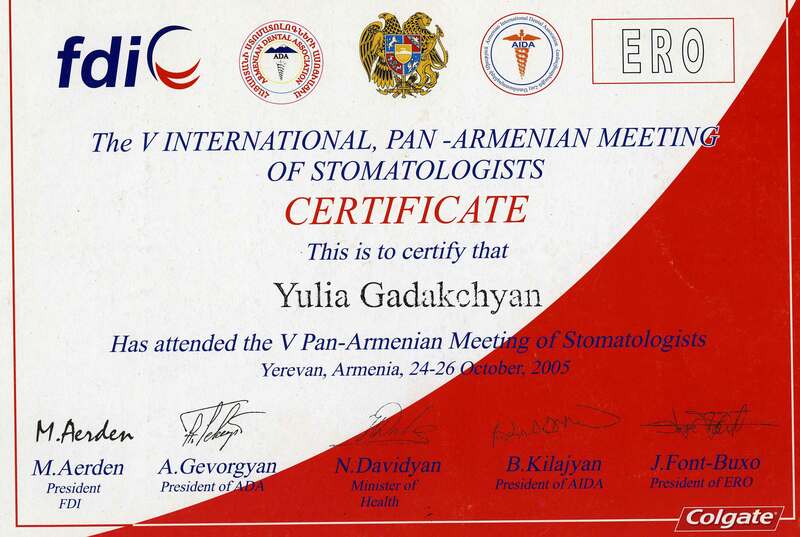 I haven't hesitated during choosing a clinic in Armenia, choice was unequivocal. 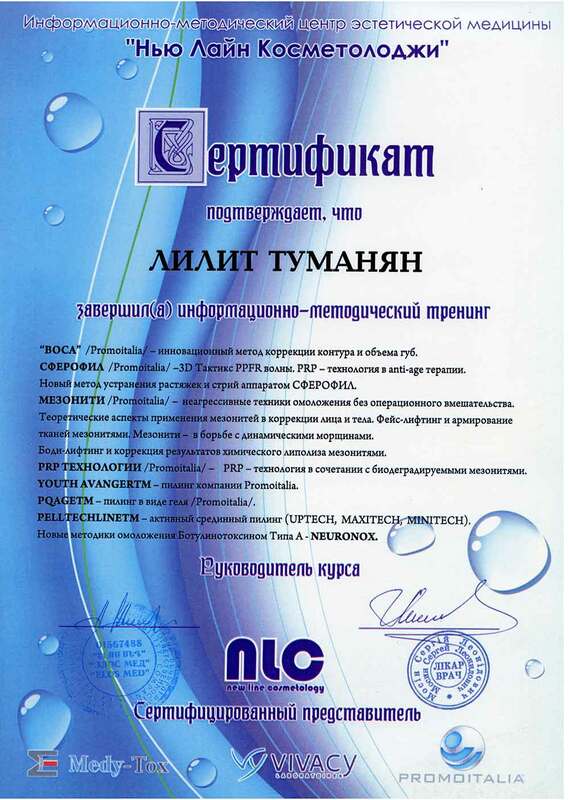 Avanta is a wonderful clinic: highly qualified professional doctors, caring and attentive managers. 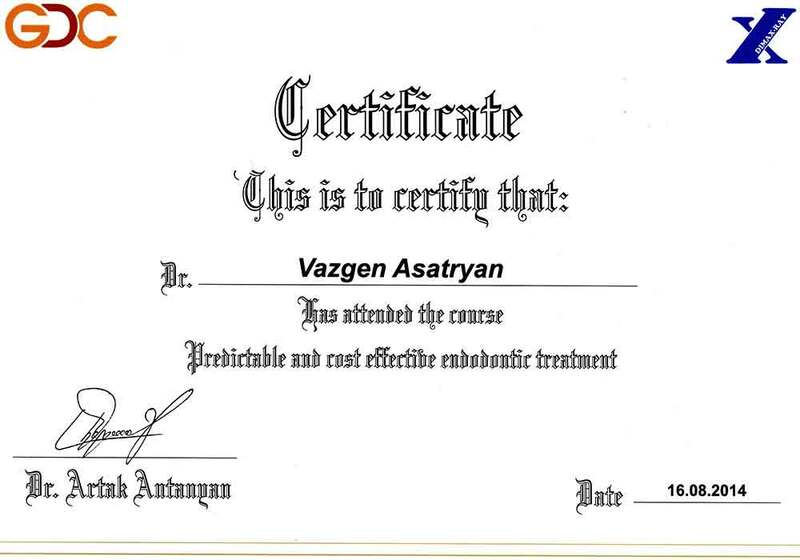 Special thanks to doctor Vache for professionalism. 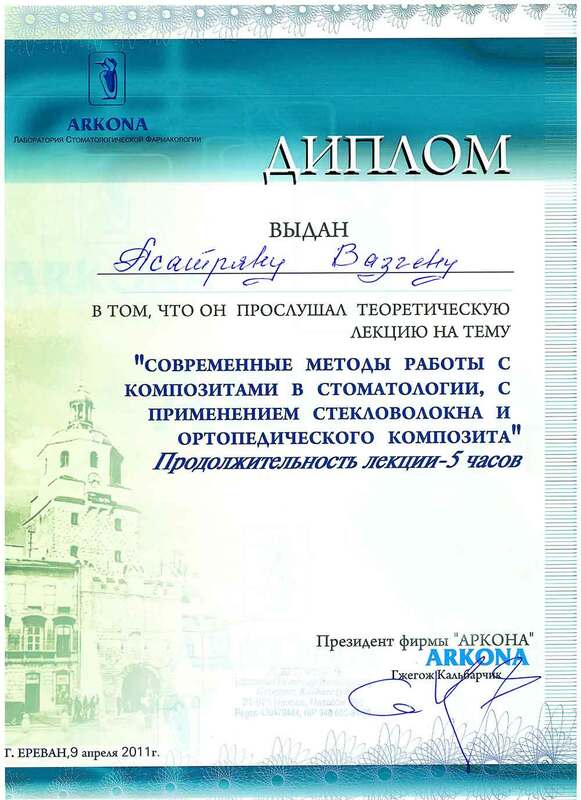 I don’t treat only in Avanta, I am friend with Avanta. 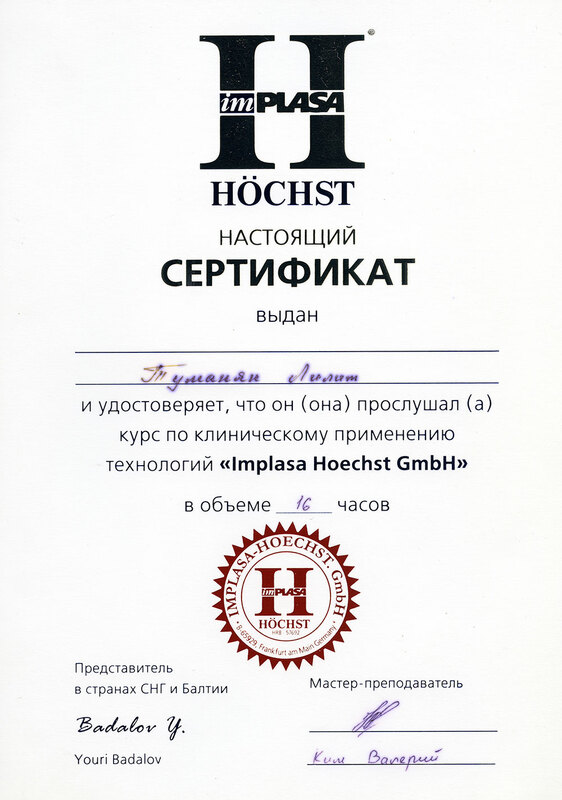 Here, all the staff are treated about you, just as they have been waiting for your visit for days. 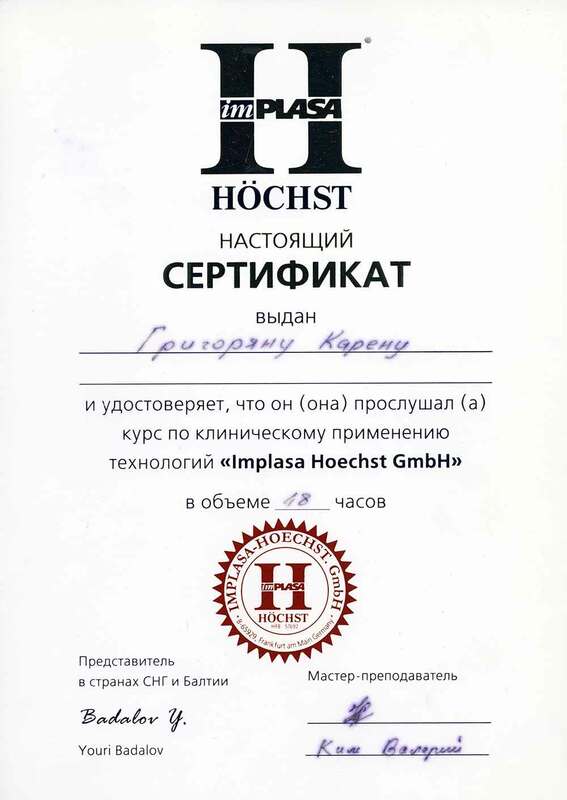 And I am sure that each customer is treated well. 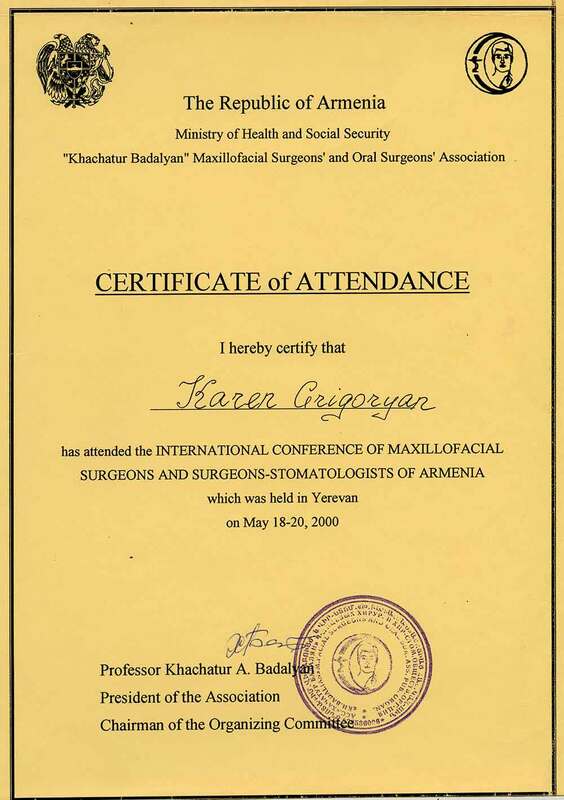 Well, Doctor Karen Grigoryan is a wonderful person, a good friend and a reliable doctor. 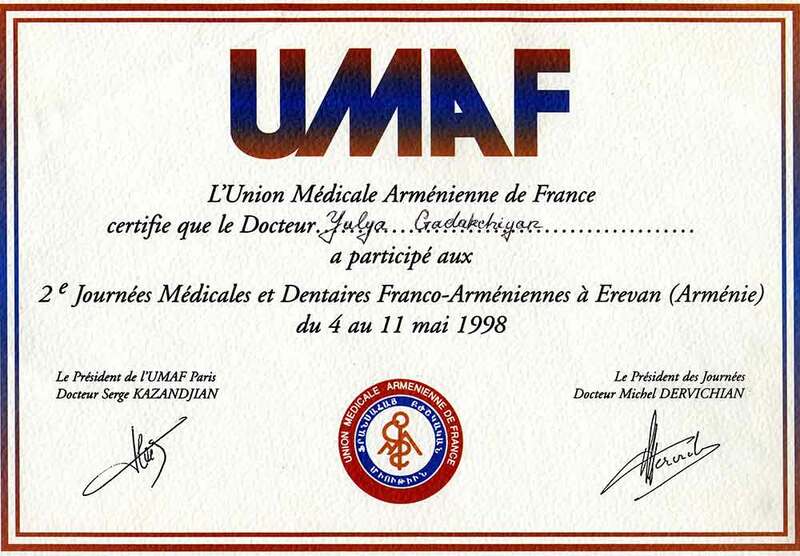 This is a unique phenomenon that I'm not afraid of going to a doctor and I do not worry. 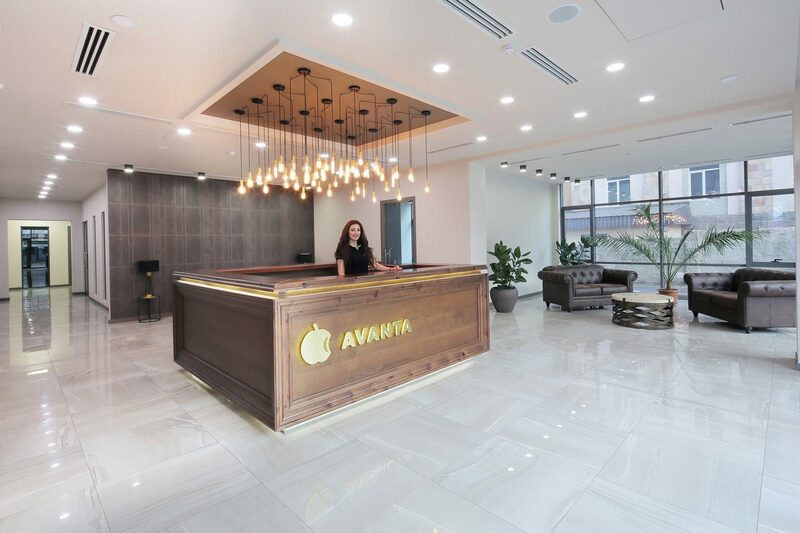 The team at Avanta take Dentistry to a new level. 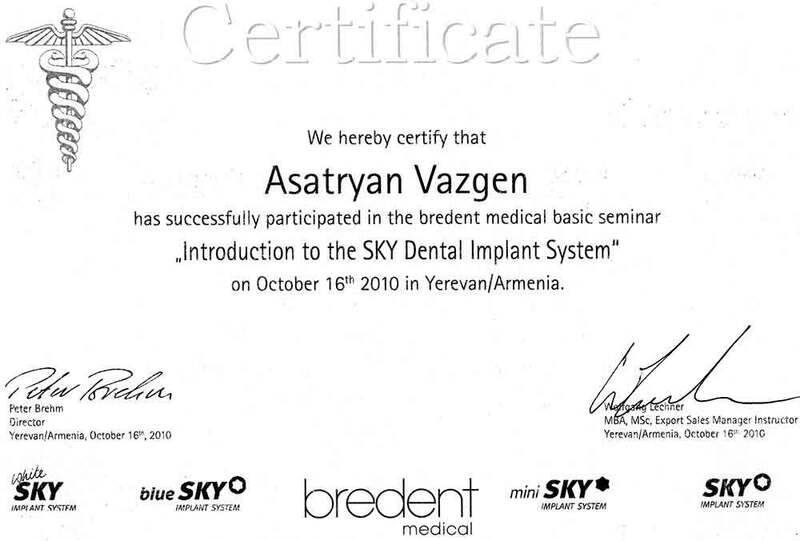 When I first arrived in Armenia with my family nearly 4 years ago we discovered the Avanta Clinic by chance; and what a find it was. 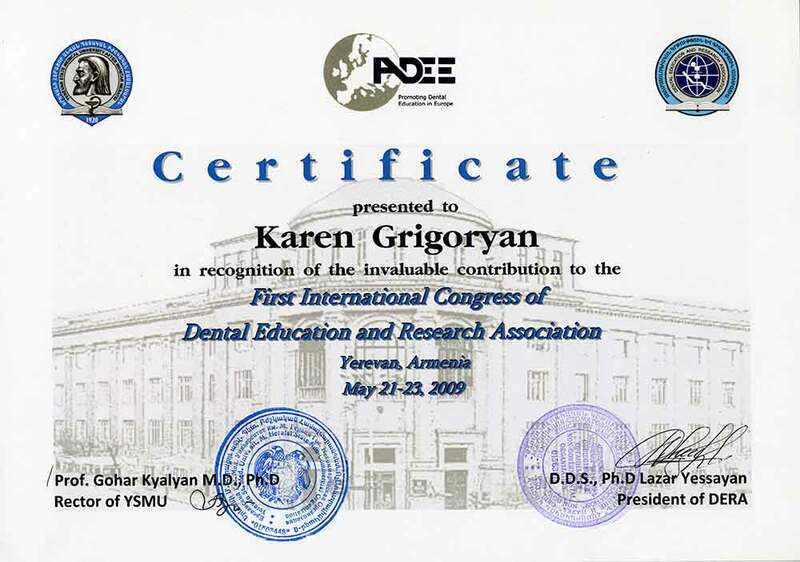 I have lived in various countries around the world and never before have I experienced such high, professional standards, coupled with state of the art equipment, from a dental practice anywhere else. 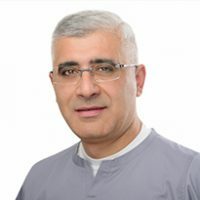 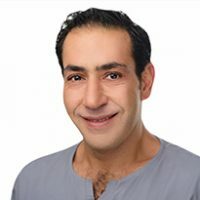 From the swift, courteous and accommodating service at reception to the expert, treatment from the highly professional Dr Njdeh Shadoyan, the whole Avanta experience makes it a pleasure to actually visit the dentist! 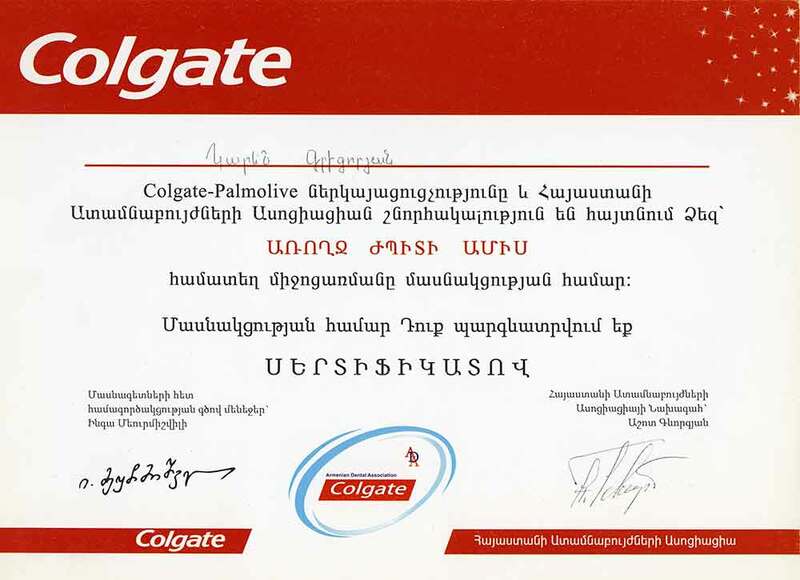 Although I initially went to Avanta for some relatively routine treatment (fillings, crown etc caused by own personal laziness!) 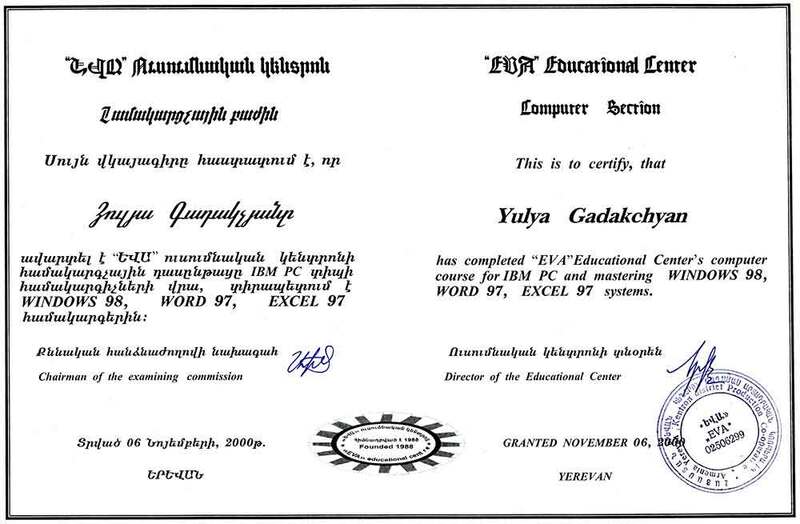 the options I was offered and the cutting edge technology used were remarkable. 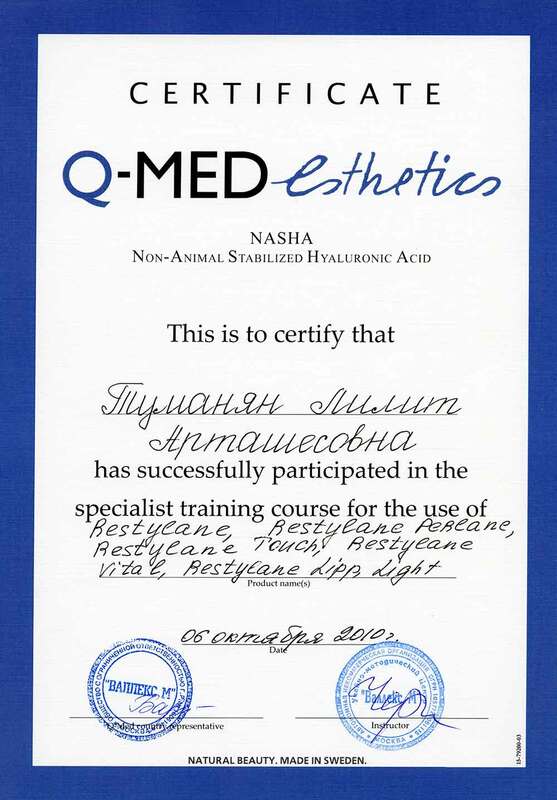 Everything was explained to me in a patient and methodical way and I never felt under pressure to make hasty decisions or to be persuaded to have any unnecessary treatment. 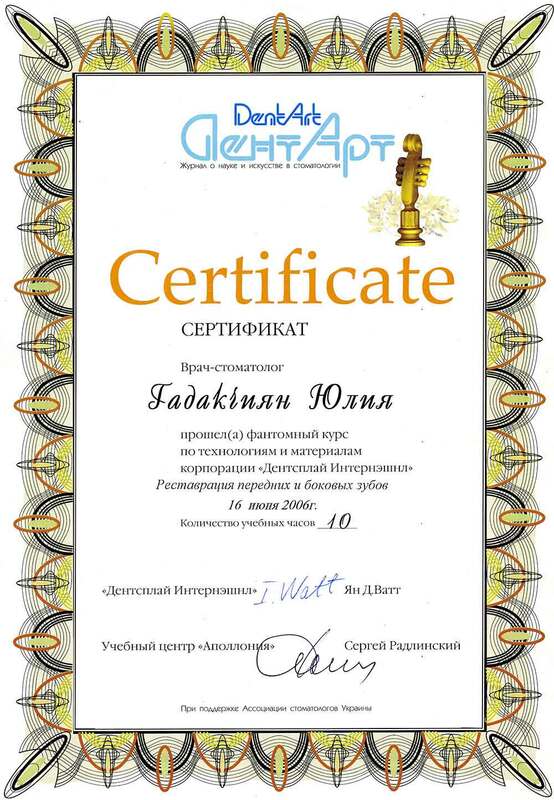 And as for cost, that was also a pleasant surprise! 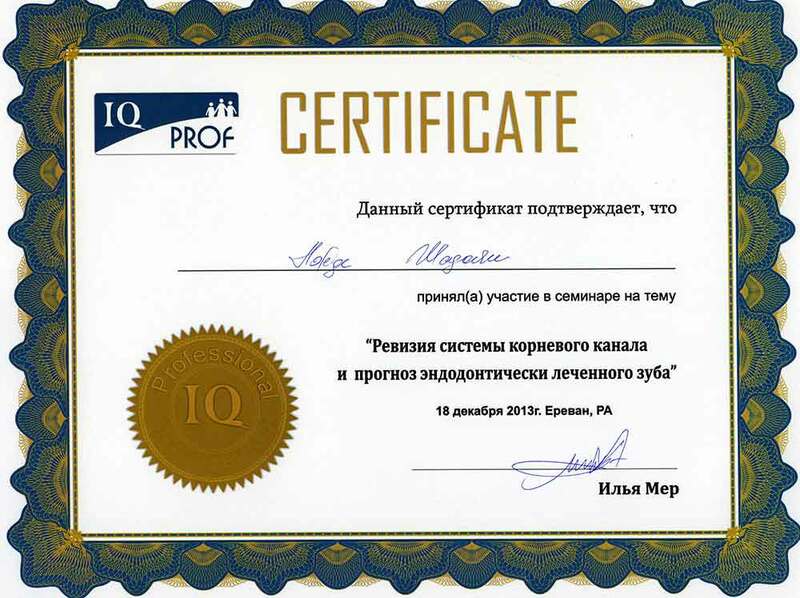 It is clear that professional reputation is the driver at Avanta and not excessive profit. 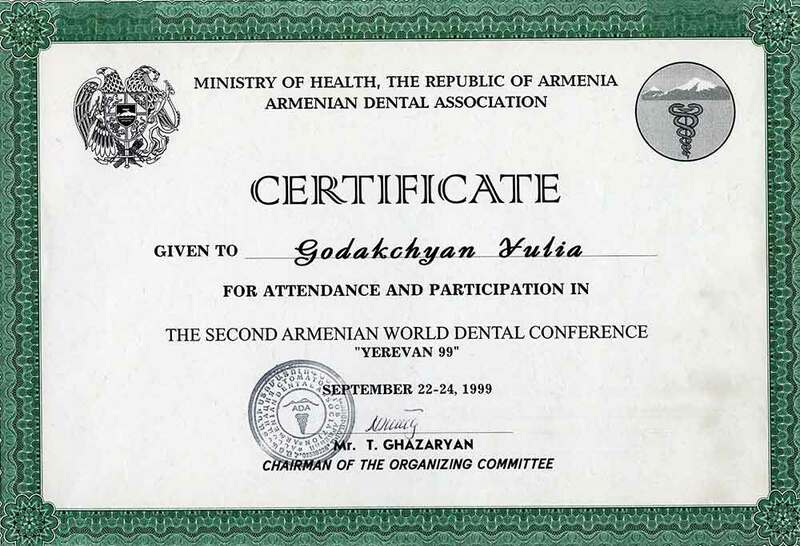 The treatment I received using the latest advancements in dentistry cost less than I would pay for standard treatment in my own country – so much so that we would seriously consider flying to Armenia in the future just for dental treatment. 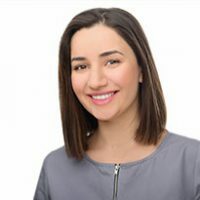 I have recommended Avanta to friends and colleagues who have been equally as impressed, and I will continue to do so because I honestly can’t speak highly enough of the whole team. 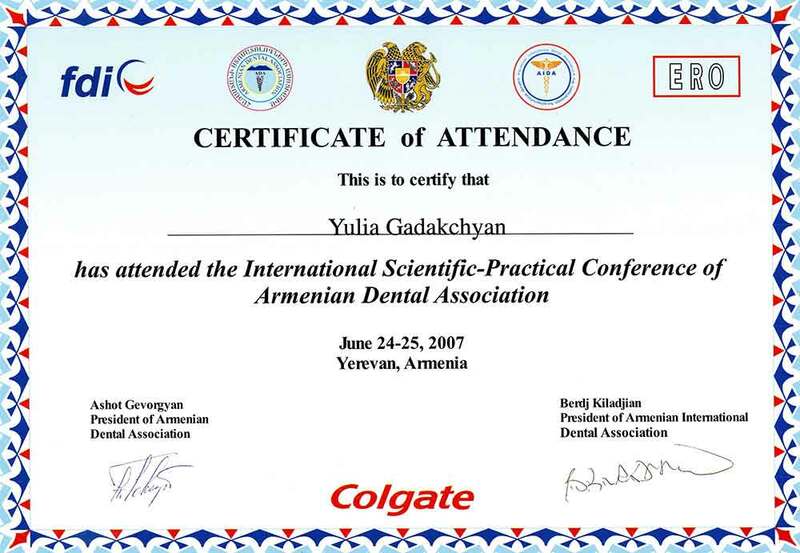 I crossed paths with the Avanta dental clinic while on holidays in Yerevan. 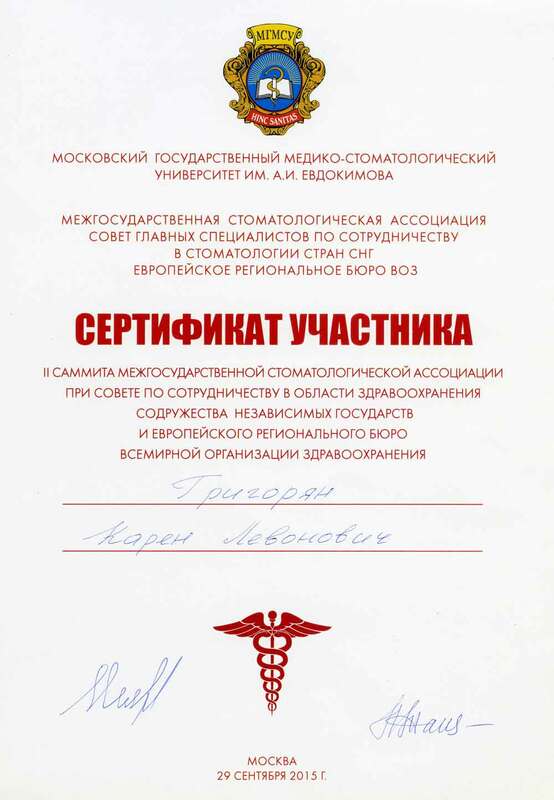 My almost last minute appointment for examining a problem that arose during the trip was accommodated. 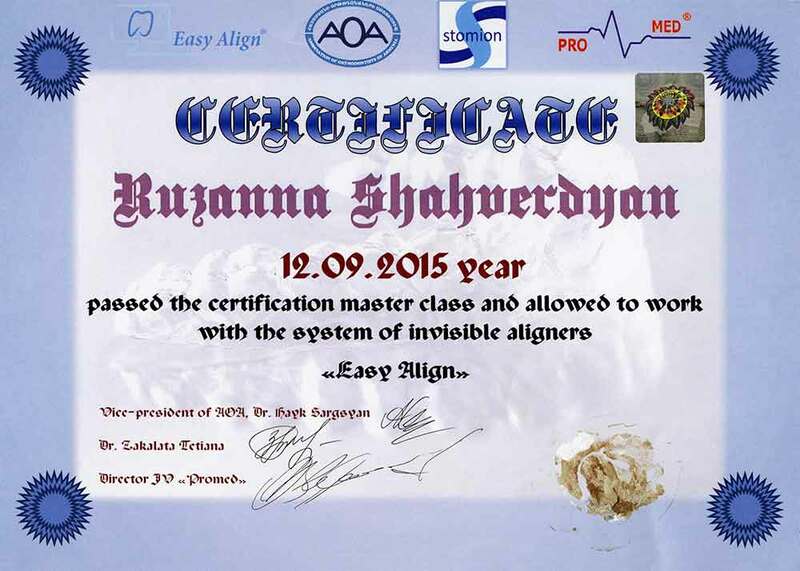 I was carefully and successfully treated by Dr. Njdeh Shadouyan. 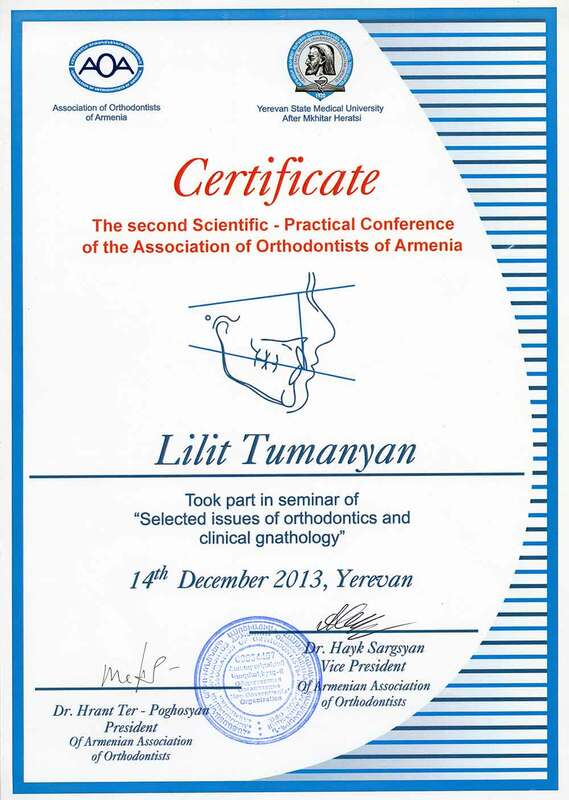 Impressed with the quality and affordability of the treatment, I enquired about options for my missing teeth. 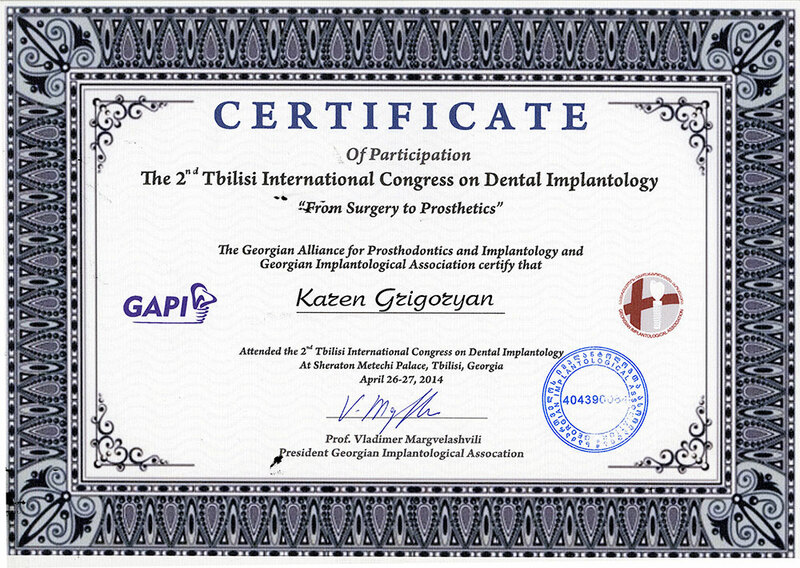 I had procrastinated about them for some time already due to the excessive cost of implants in Canada. 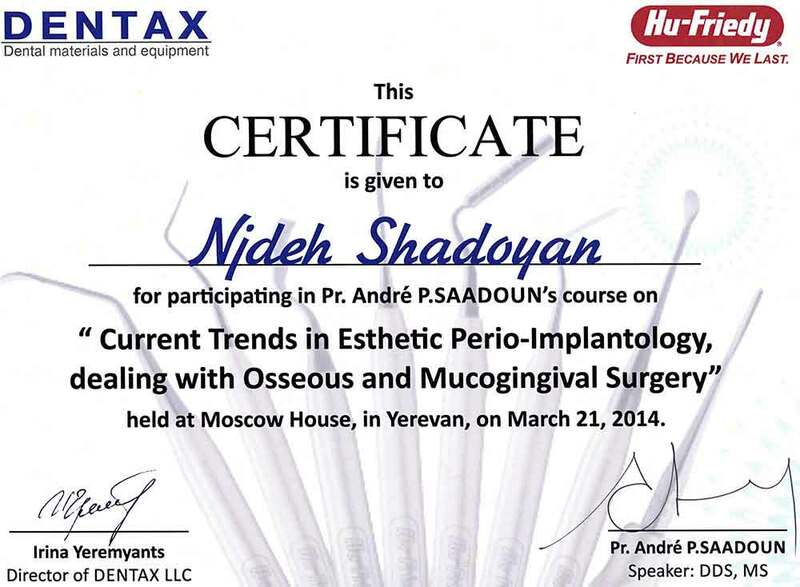 I extended my stay and Dr. Njdeh performed the surgery. 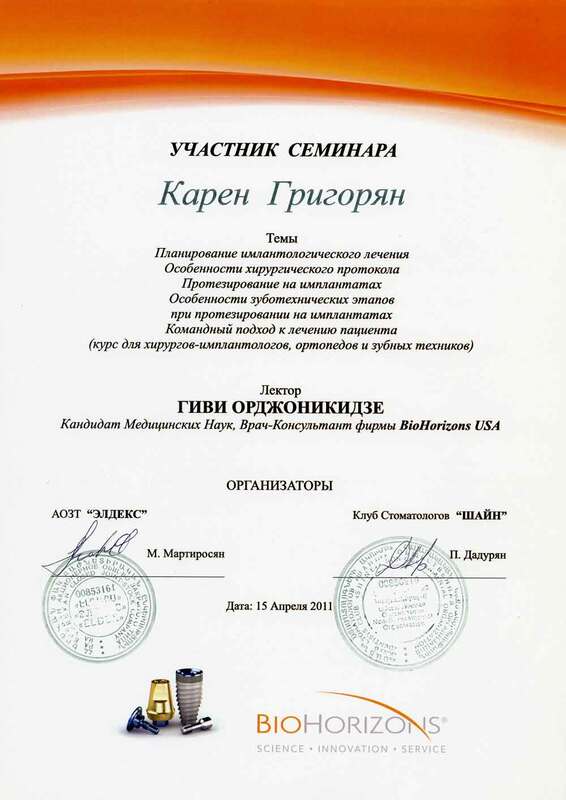 He is meticulous in his work and strives for excellence. 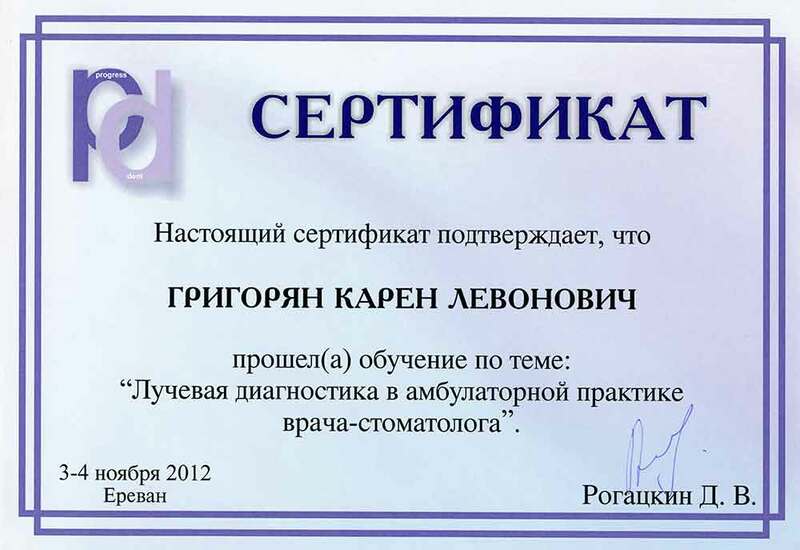 He explains through x-rays and tests and enjoys a friendly personality. 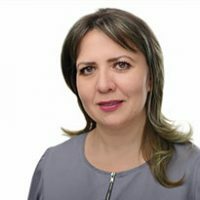 The clinic’s receptionist Ms. Lilit also played a pivotal role and is fully informed about the status of the treatments and the necessary follow-up appointments. 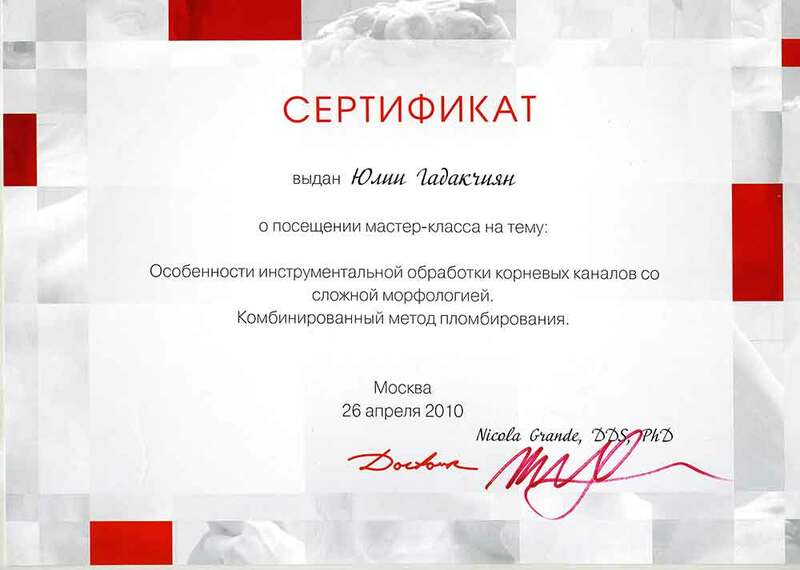 I had no complications after the surgery and everything has healed perfectly. 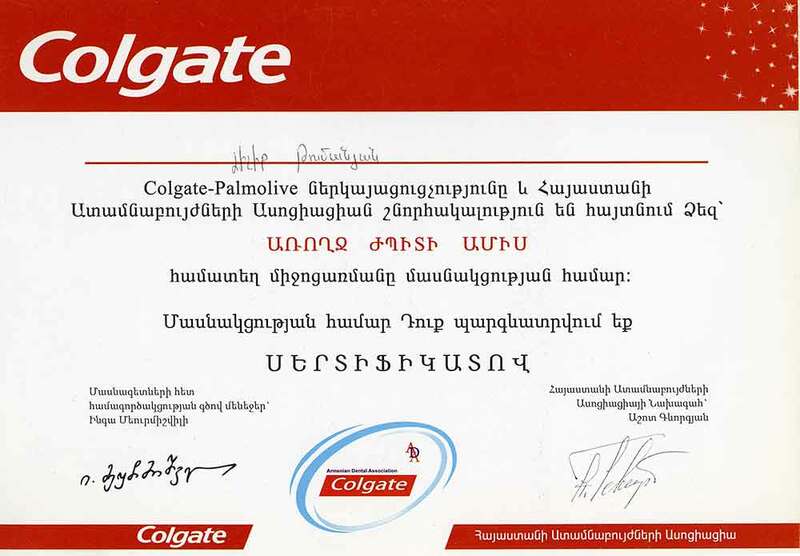 Once again, I’m enjoying a strong, full set of teeth, thanks to Dr. Njdeh and his colleagues in the Avanta clinic. 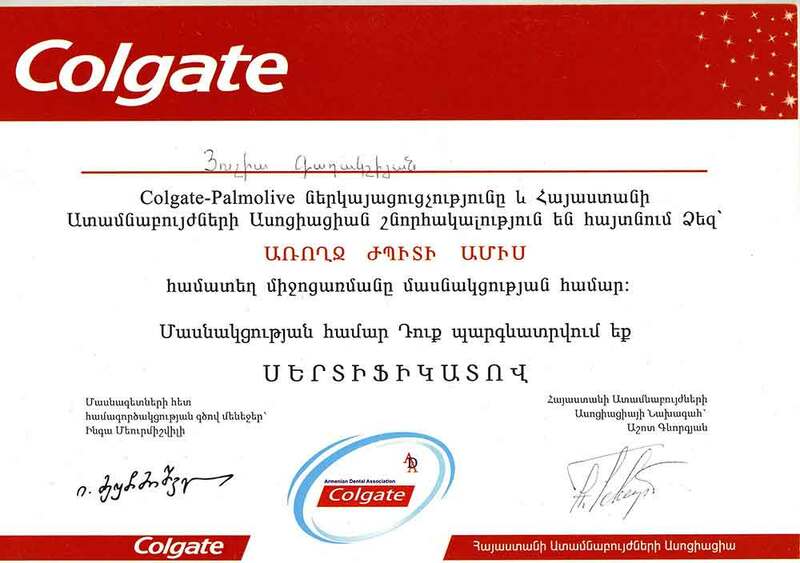 Little did I think I would be singing praises for a dental office in Armenia but without a doubt I would recommend this group to anyone. 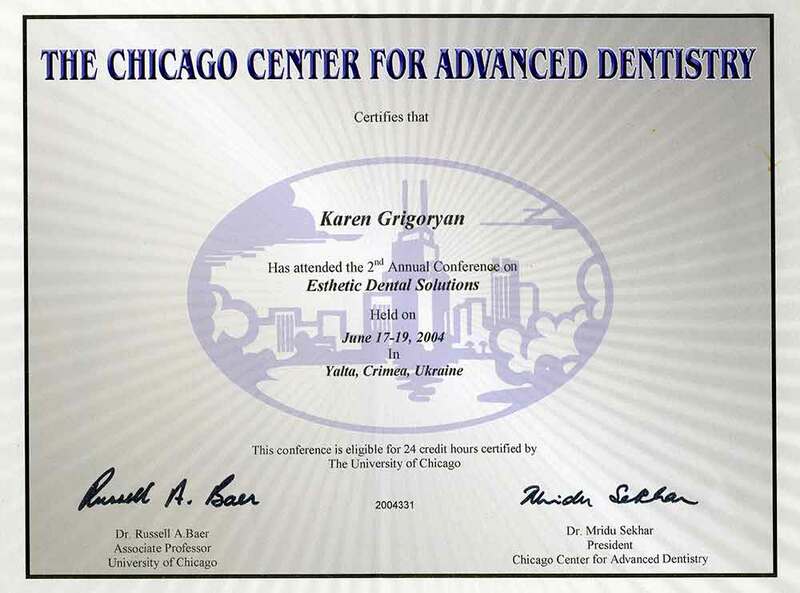 This is a strong statement considering if I had a phobia it would be about time spent in a dental chair. 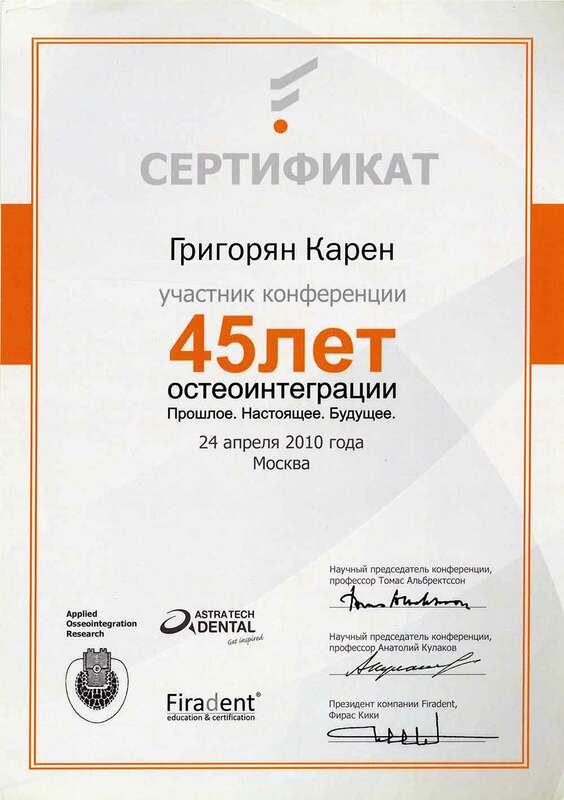 The dental staff was professional and competent, always with the goal of having a satisfied customer. 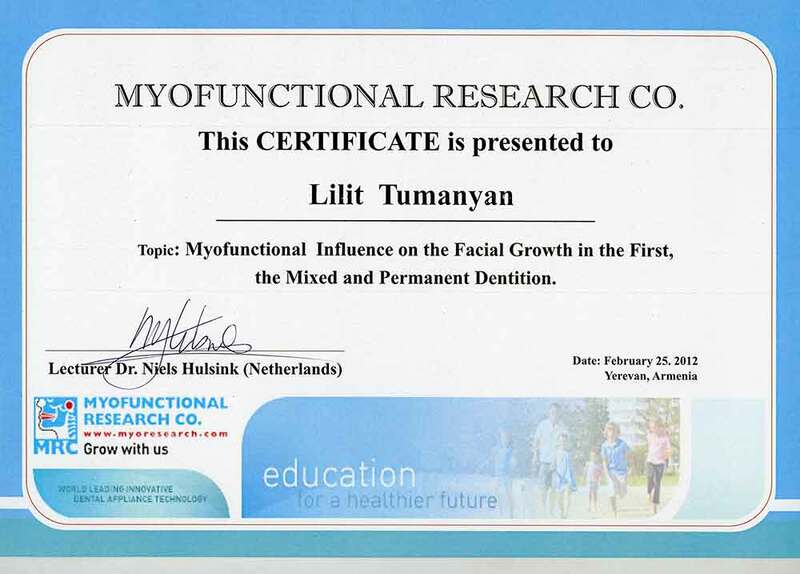 The results were wonderful and I will always be grateful for their excellent service. 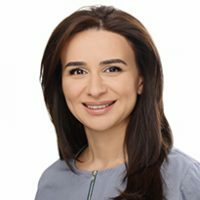 I want to share with everyone my impressions. 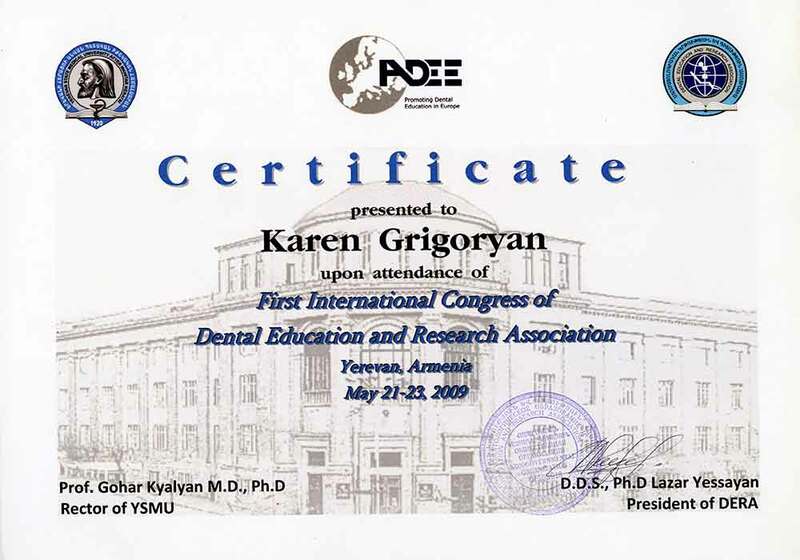 In the short time possible, Dr. Karen Grigoryan solved all the problems conserning to my teeth. 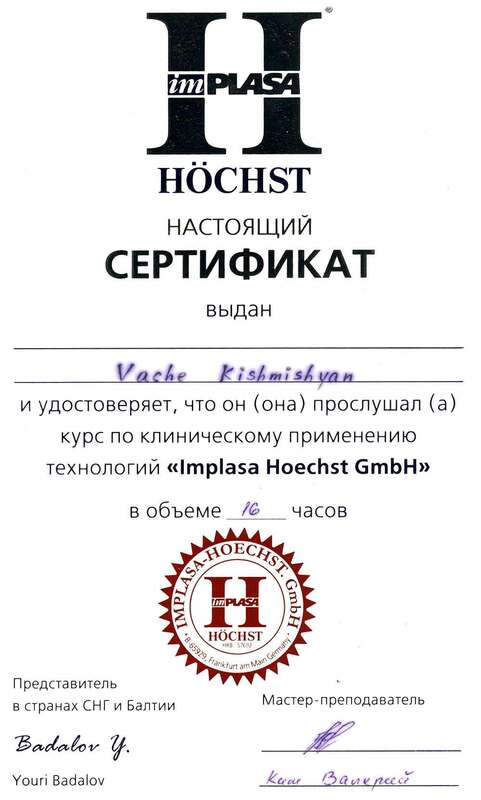 I am thankful for that a lot. 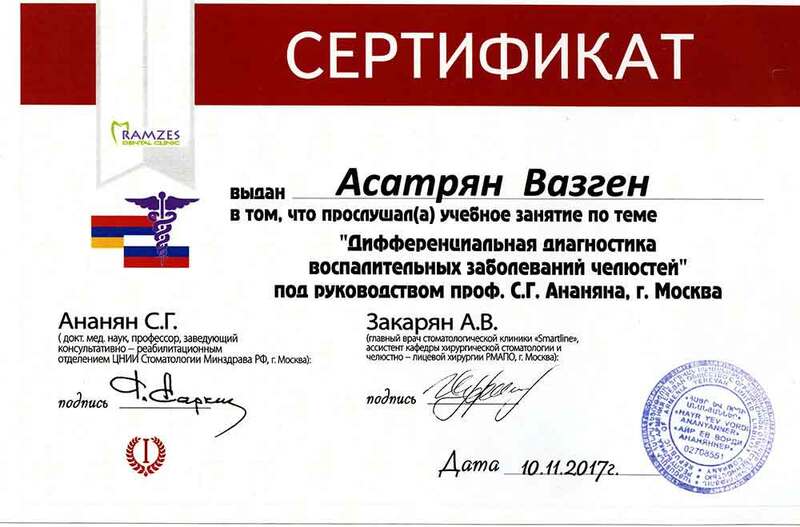 After that I tell everyone about Avanta: I like everything here a lot; doctors proffesionalism, managers attitude, and the internet is simply amazing. 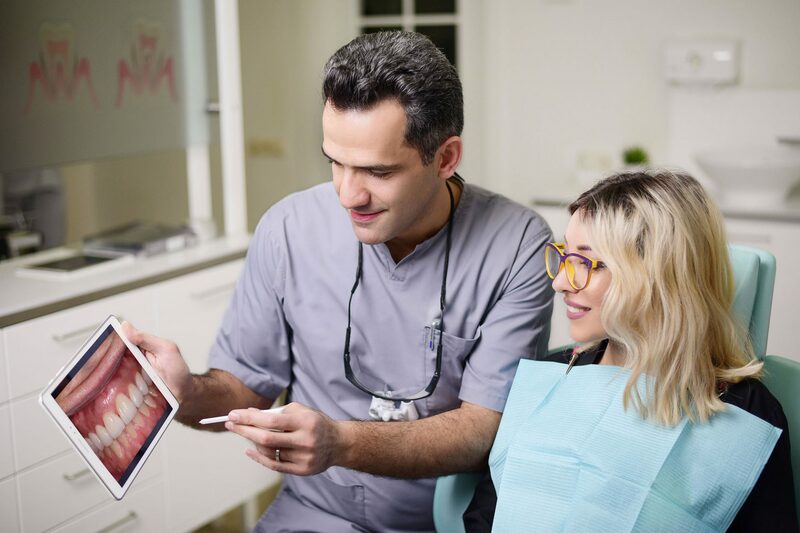 From the moment that you contact Avanta Dental Surgery, you know that you are in good hands and will receive high quality care and excellent service. 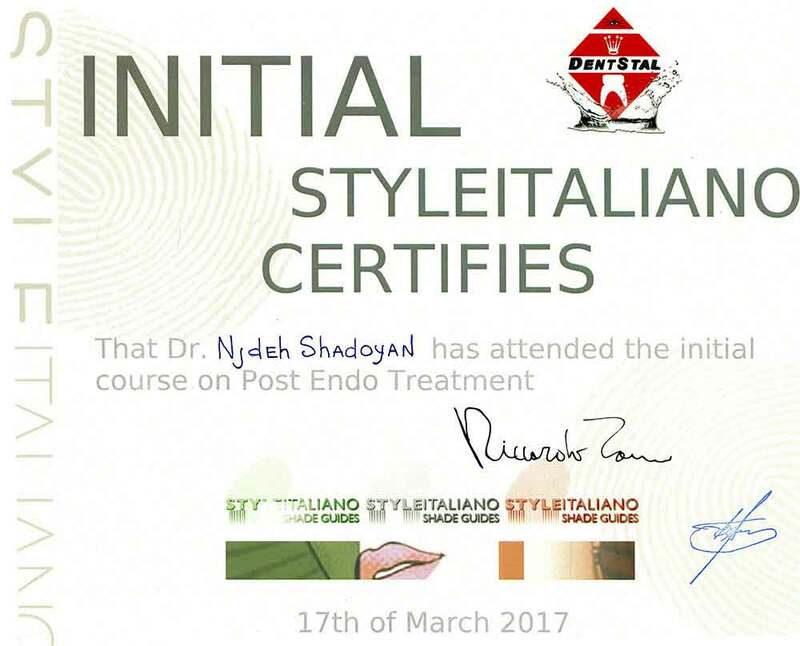 I needed substantial treatment and I cannot praise the work of Dr Njdeh too highly. 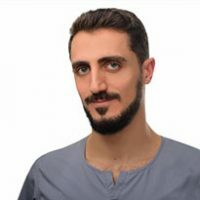 His professionalism, patience and courtesy gave me confidence; so much so that I plan to have comprehensive dental treatment at Avanta needed because I have avoided dentists in the past. 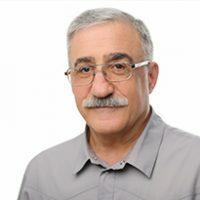 Dr. Njdeh took the time to explain everything. 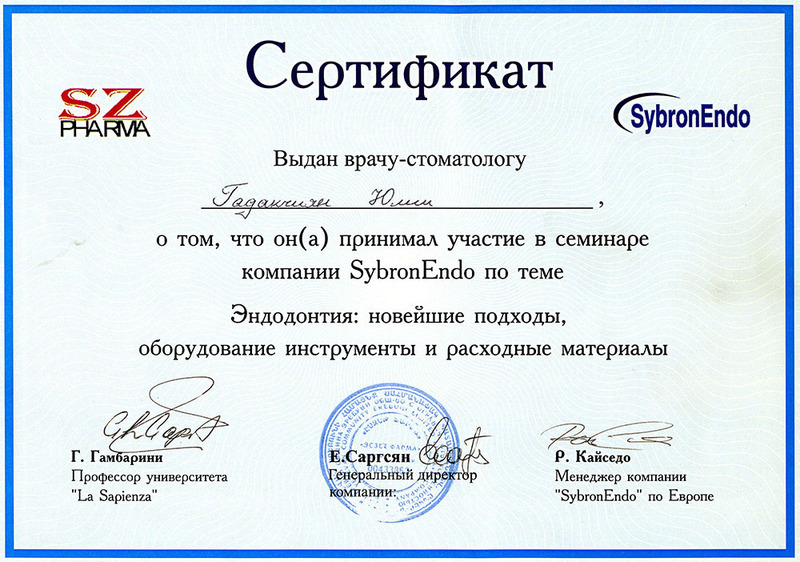 Family and friends have remarked on the excellent work that he has done. 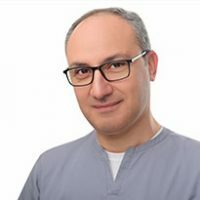 It is a pleasure to recommend Dr Njdeh and the team at Avanta. 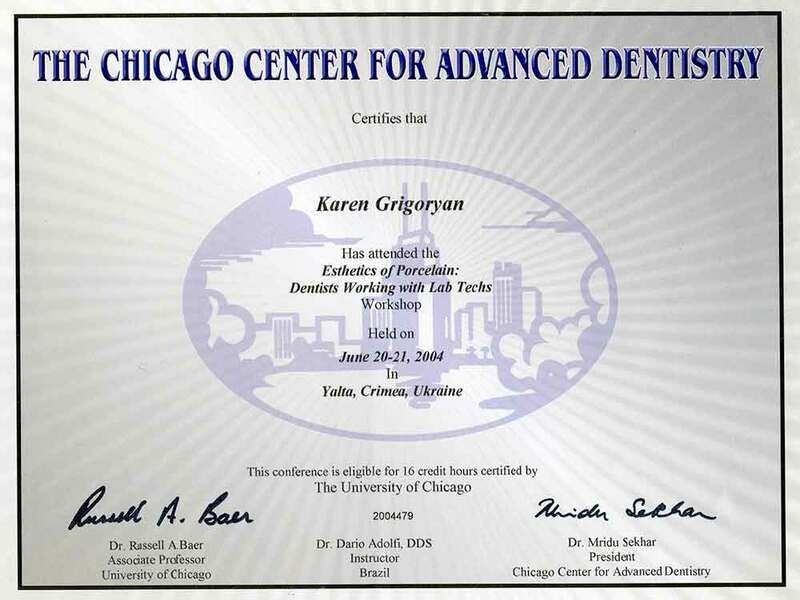 You can have every confidence in them to provide an excellent standard of dental treatment. 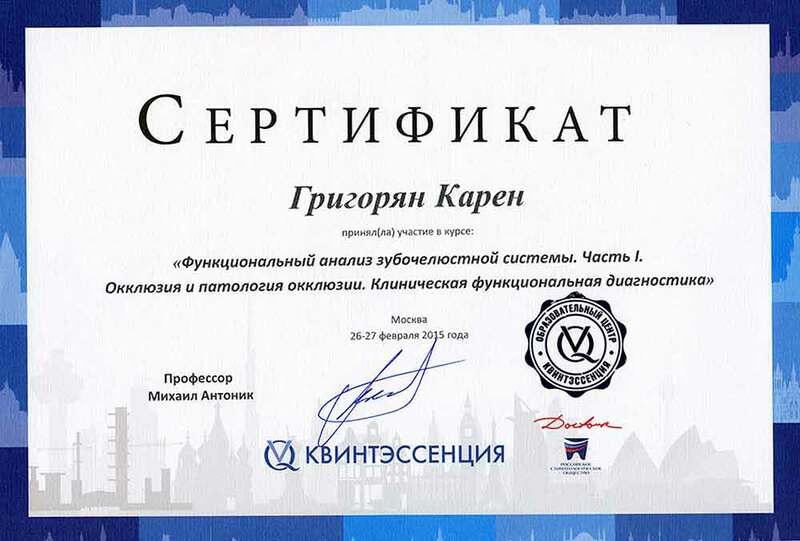 They are a team dedicated to quality and care. 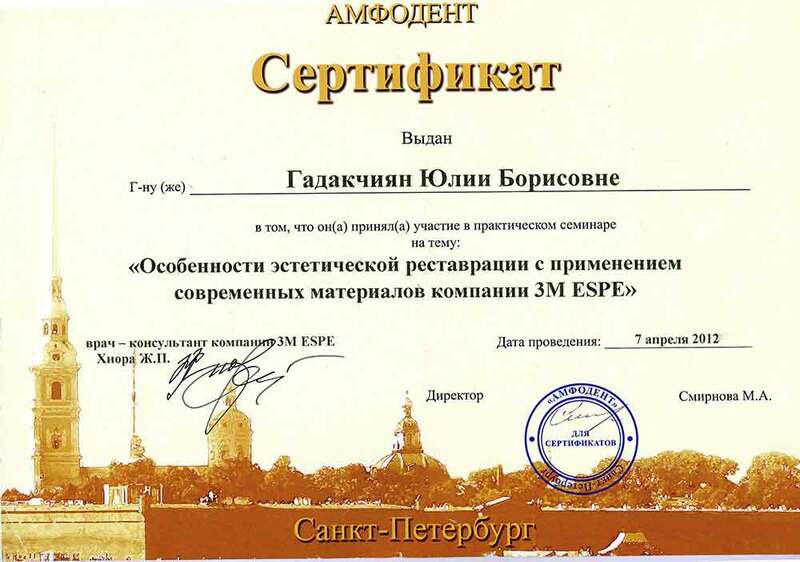 I live in Madrid. 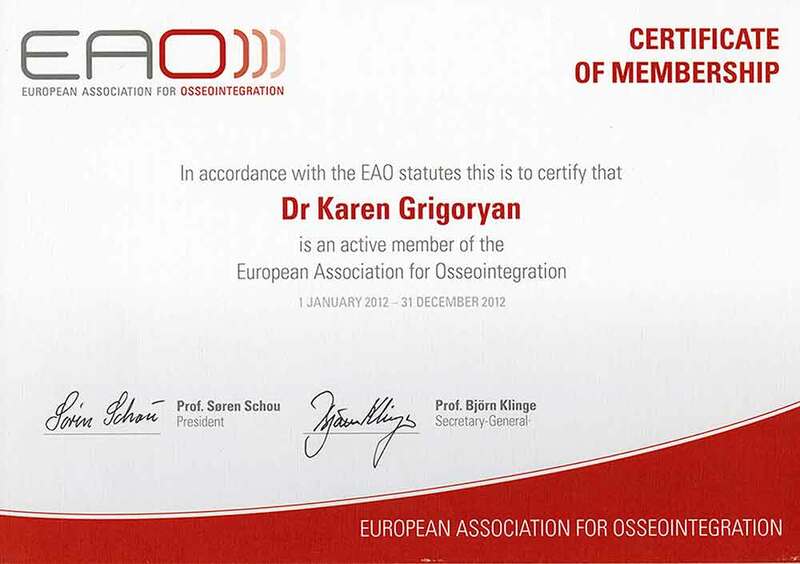 I had only 4 free days and Spain’s exclusive insurance,which also refunds somatological expanses. 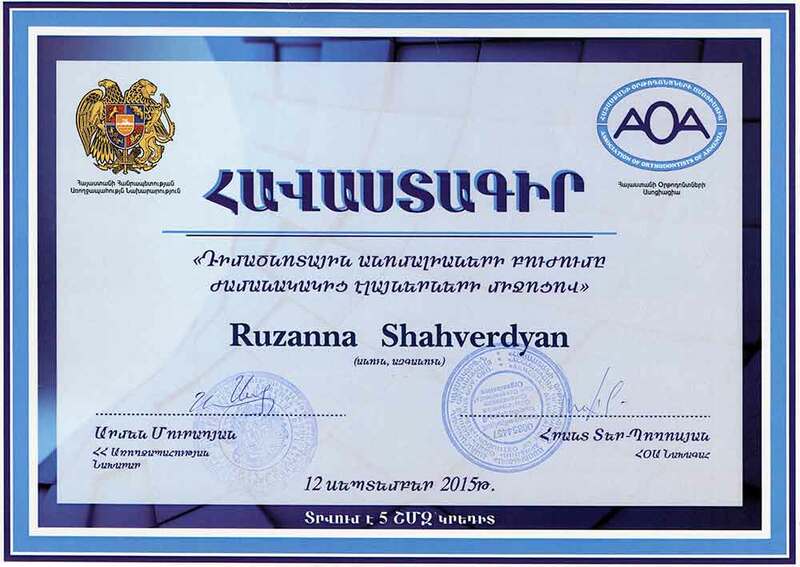 But my 4 year experience in Avanta was enough to make decision to treat in Armenia. 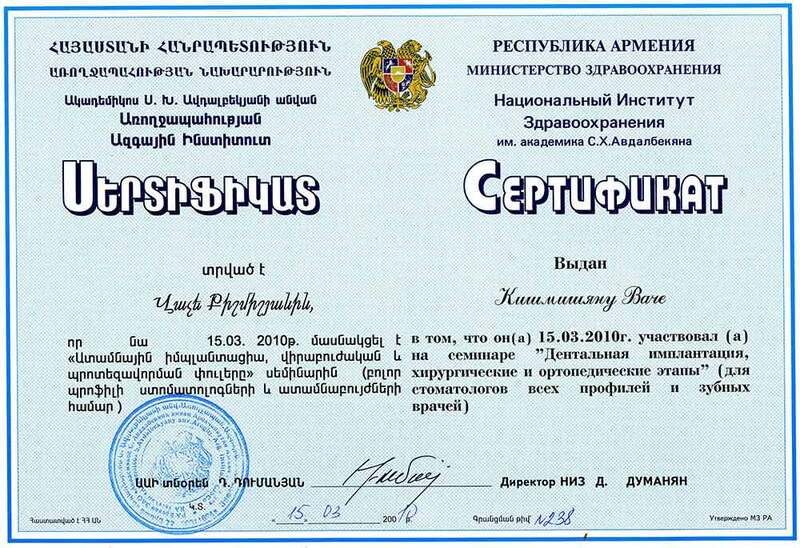 Without hesitation, I bought a ticket to Armenia, came to Avanta and right to the Doctor Yulia Borisovna. 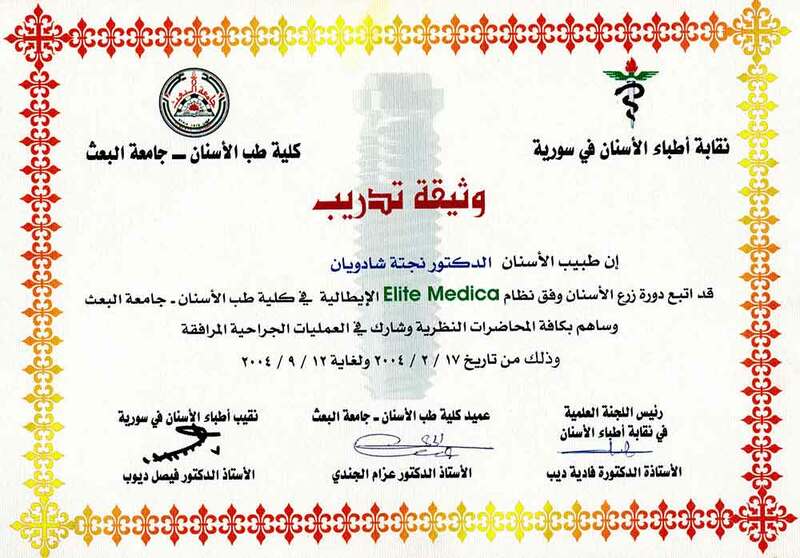 Trusting the clinic and the doctor is the biggest factor contributing to my decision Thank you all. 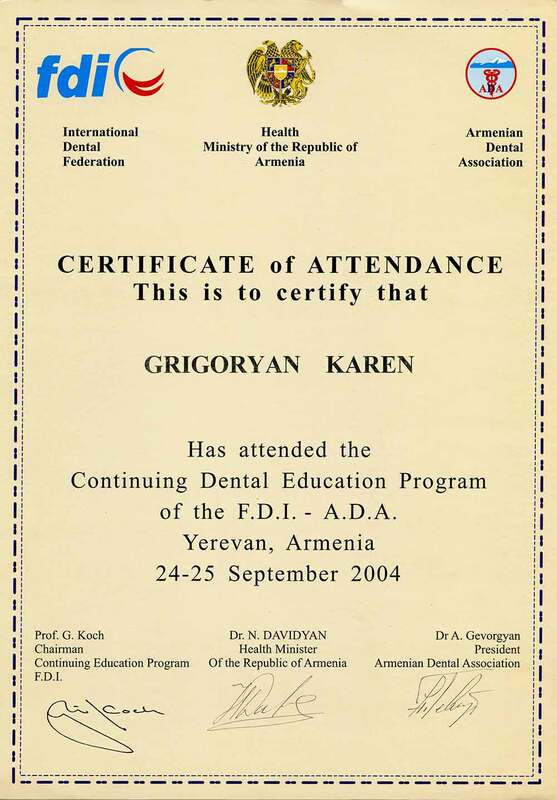 1994-1995 Internship in Republican Dental Centre. 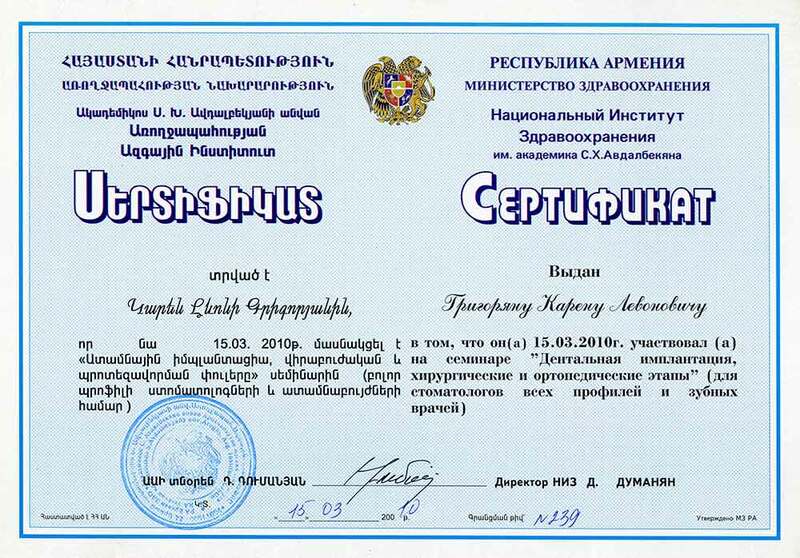 1995-1998 Residency at NIH named after Avdalbekyan. 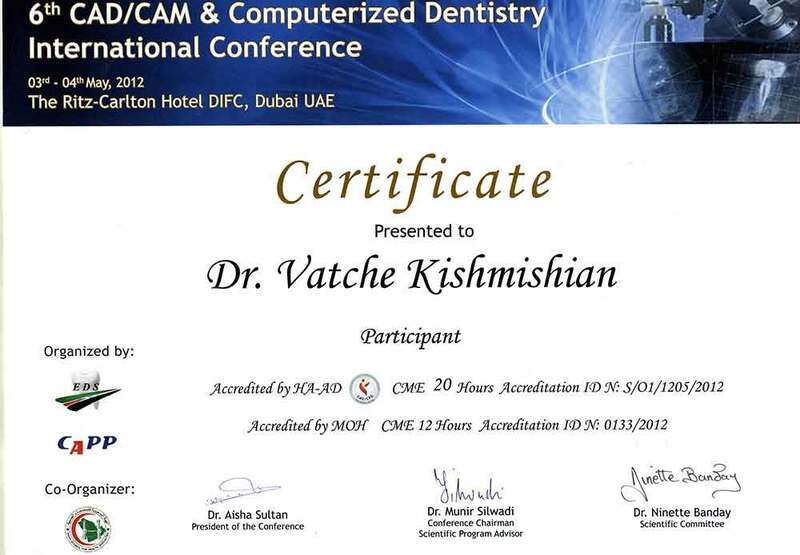 He is the author of the introduction of dental implants into clinical practice. 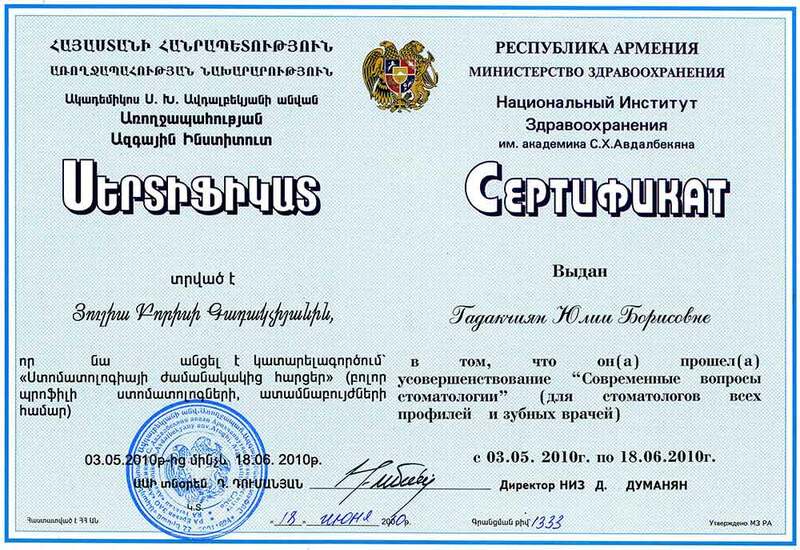 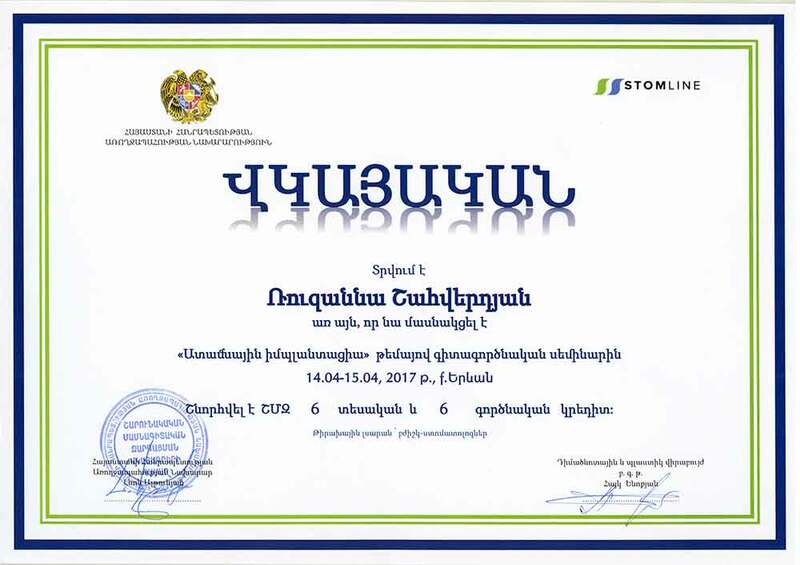 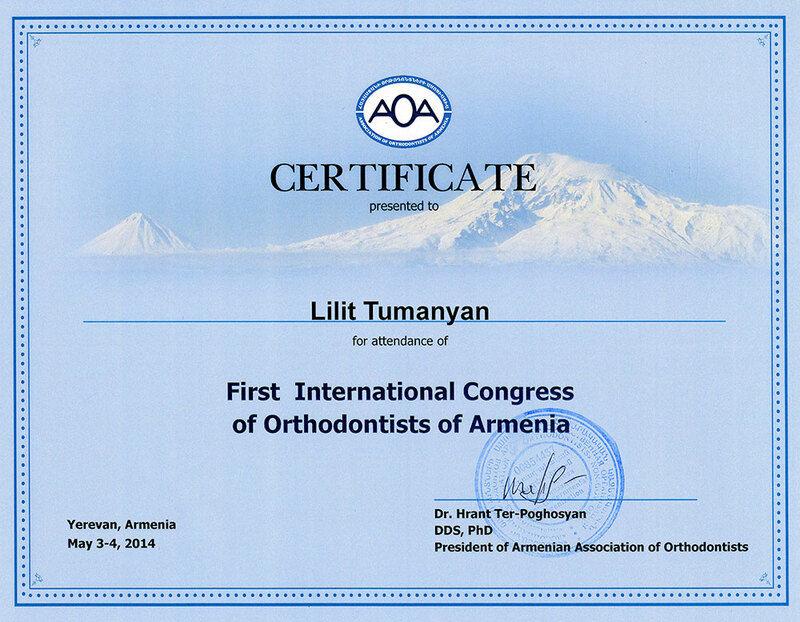 He is the first, who developed the implant system “ASI” (Armenian system of dental implants) in Armenia. 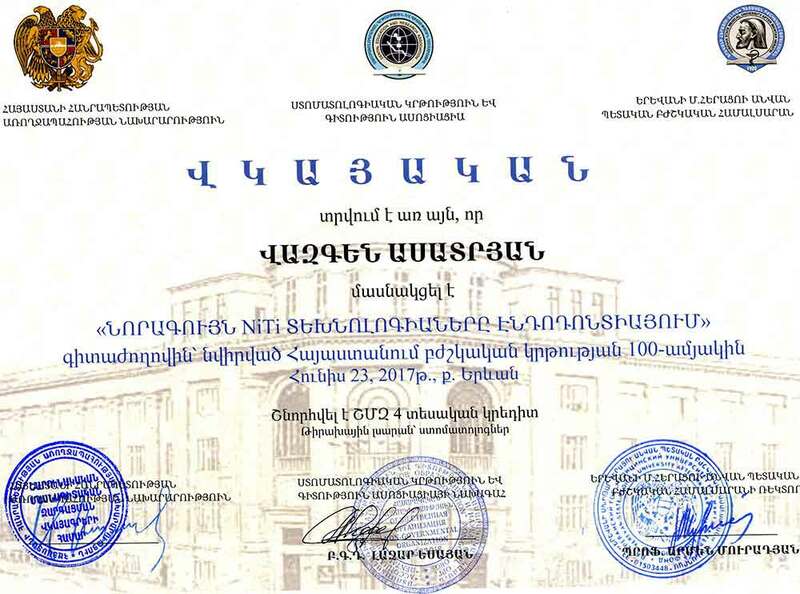 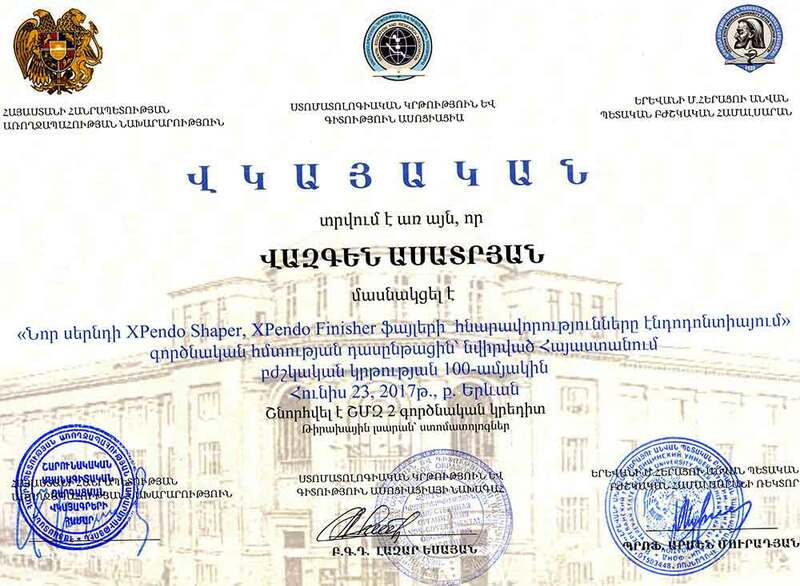 Since 1998 – Assistant Professor at NIH named after Avdalbekyan. 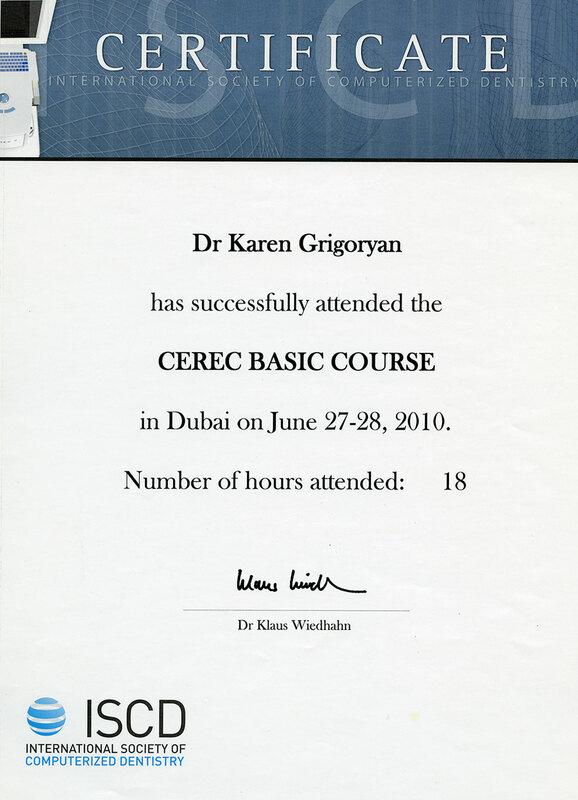 In 2001 he defended his thesis for the degree of candidate of medical sciences. 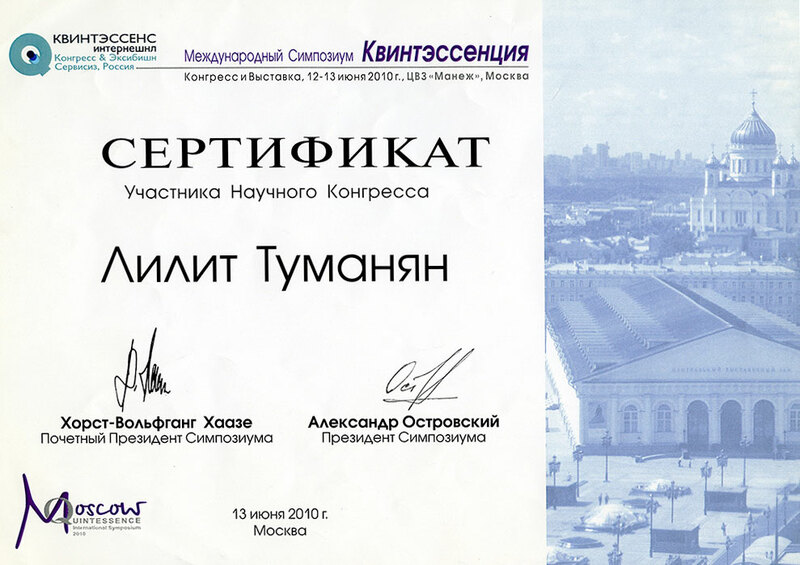 In 2002 he founded the Clinical Center of modern dentistry “Avanta”, which in 2004 was renamed as the dental implant center. 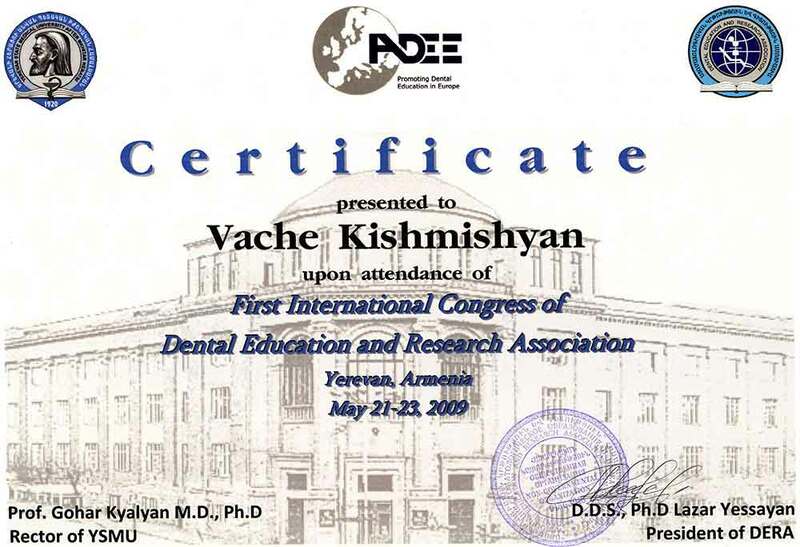 From 2003 – 2007 – Dean of the Faculty of Dentistry, NIH named after Avdalbekyan. 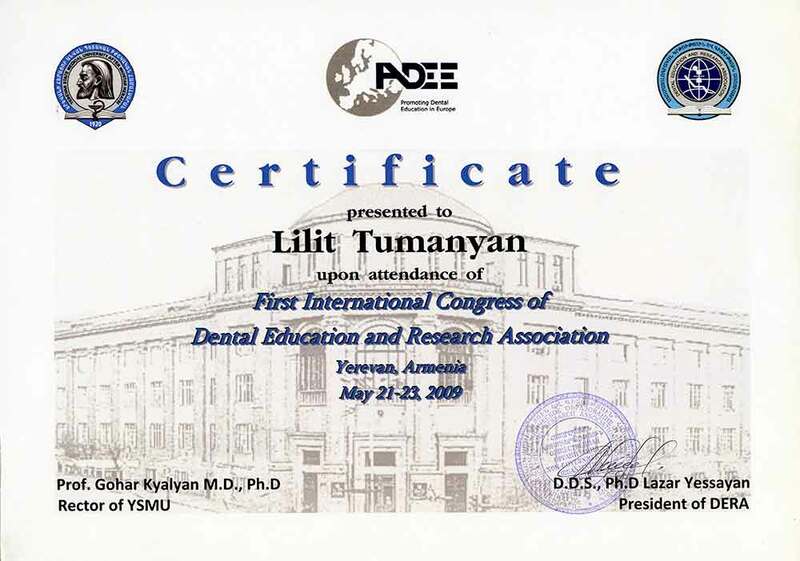 From 2003 -2005 – Head of the Department of Prosthodontics at the Armenian Medical Institute. 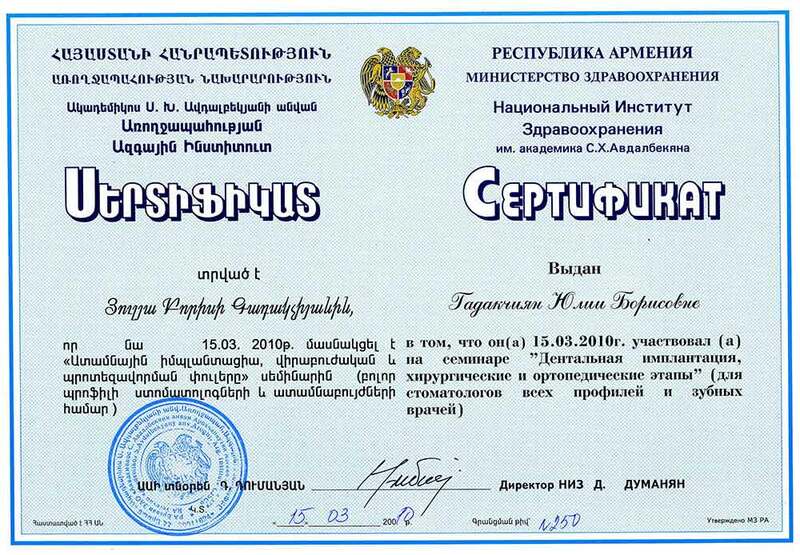 From 2003 -2010 – Chief stomatologist of  Ministry of Health of RA. 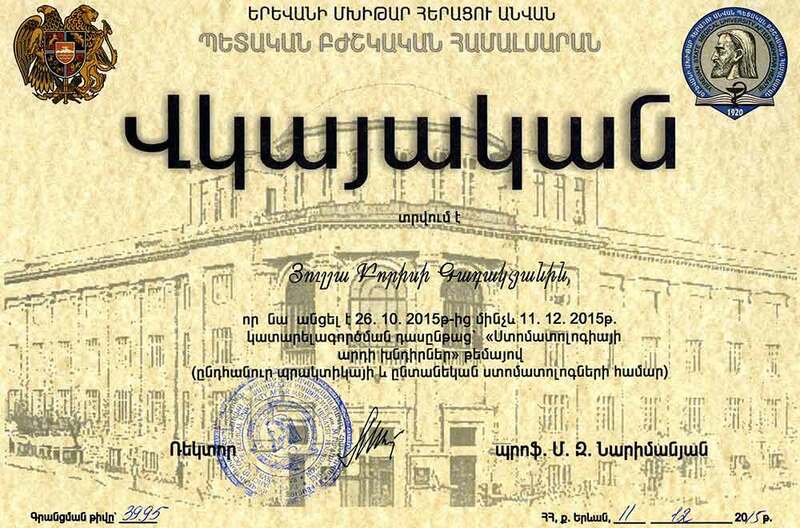 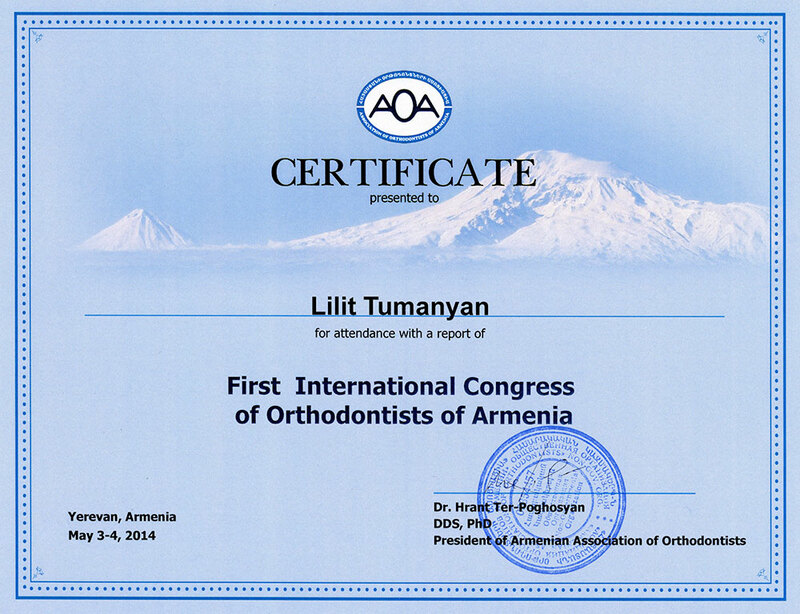 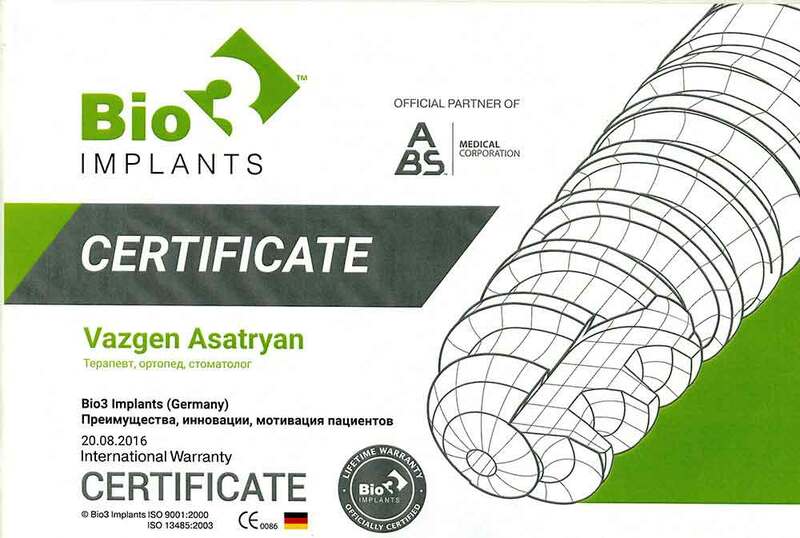 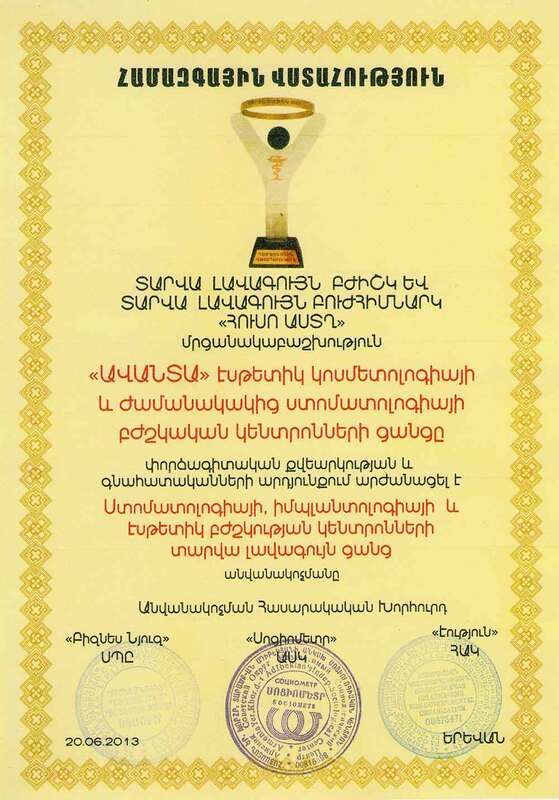 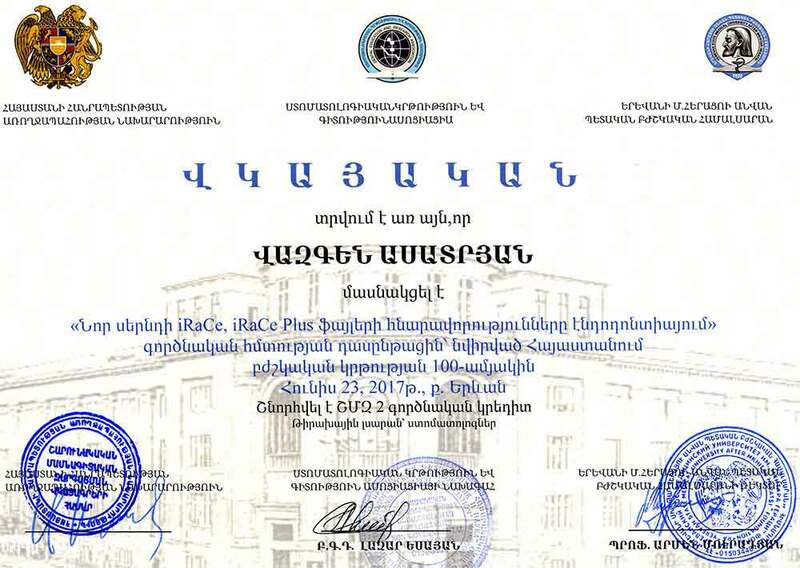 Since 2012  Founder and president of the Armenian Association of Implantologists. 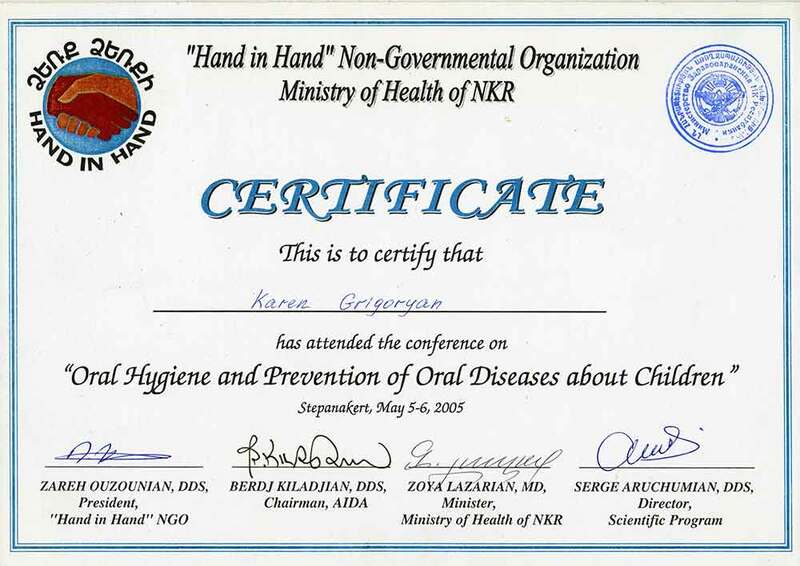 Since 2015  Chief dental surgeon and implantologist Ministry of Health of RA. 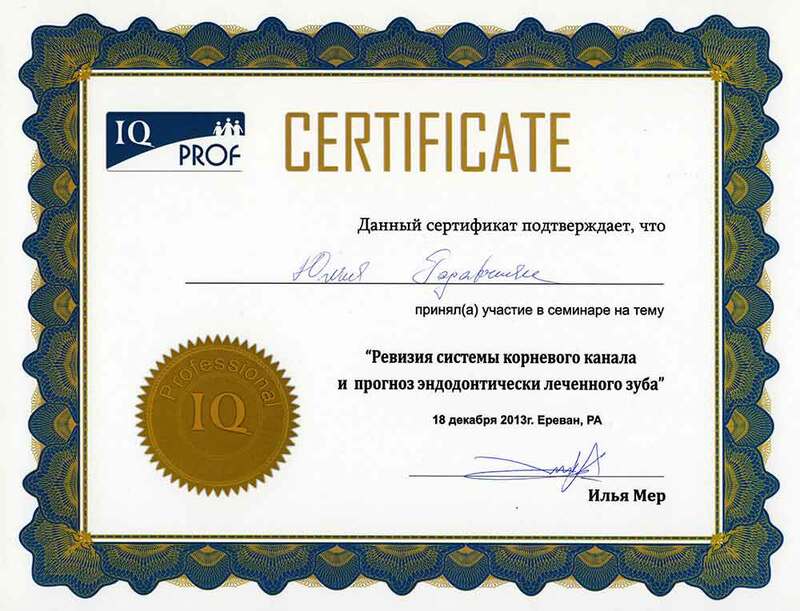 The National University of Athens, University of Loma-Linda (USA), Glasgow, London, Paris, Monaco, Shanghai, Dubai, Copenhagen, Kiev,Yalta, Berlin etc. 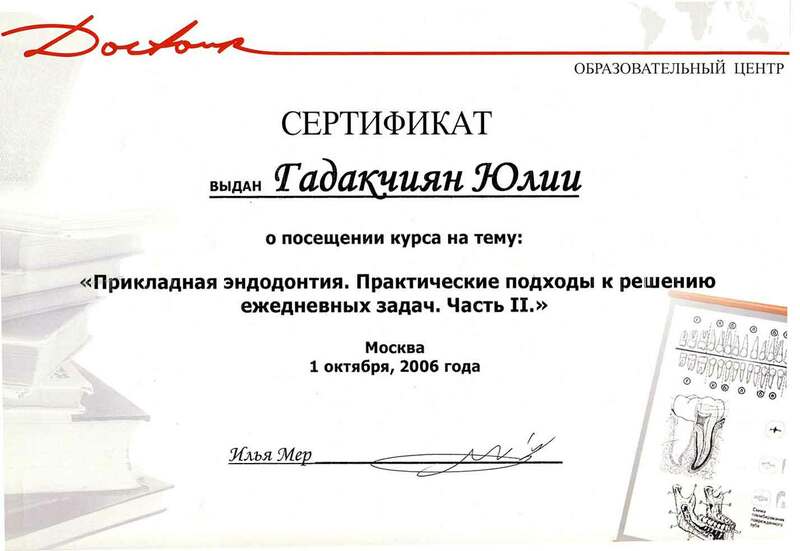 This is just a small list of the cities in which he was (more  than 100). 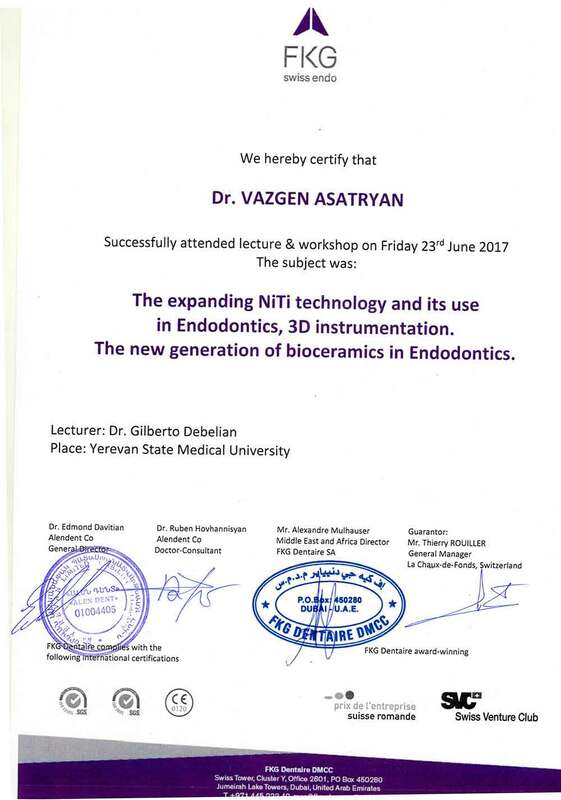 He has more than 15 patents for inventions in the field of implantology and prosthodontics and more than 40 scientific articles. 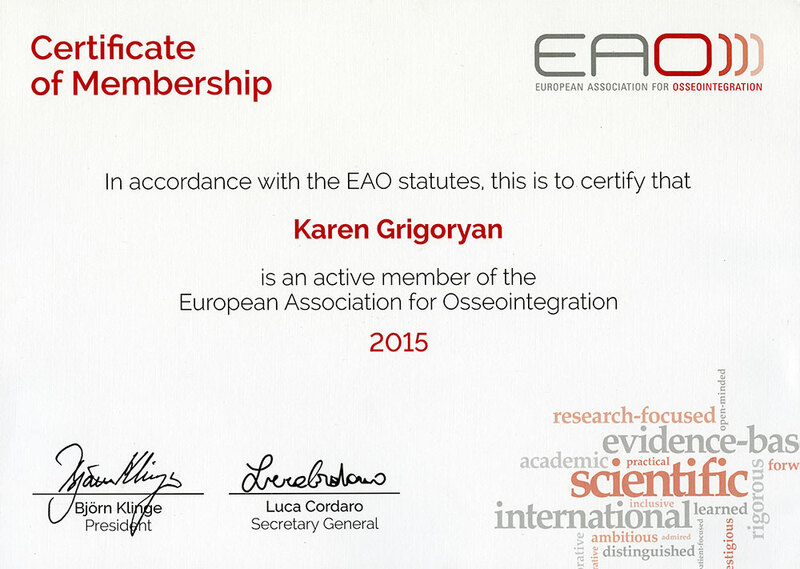 He is a member of the European Association of Osseointegration, and a number of other professional associations. 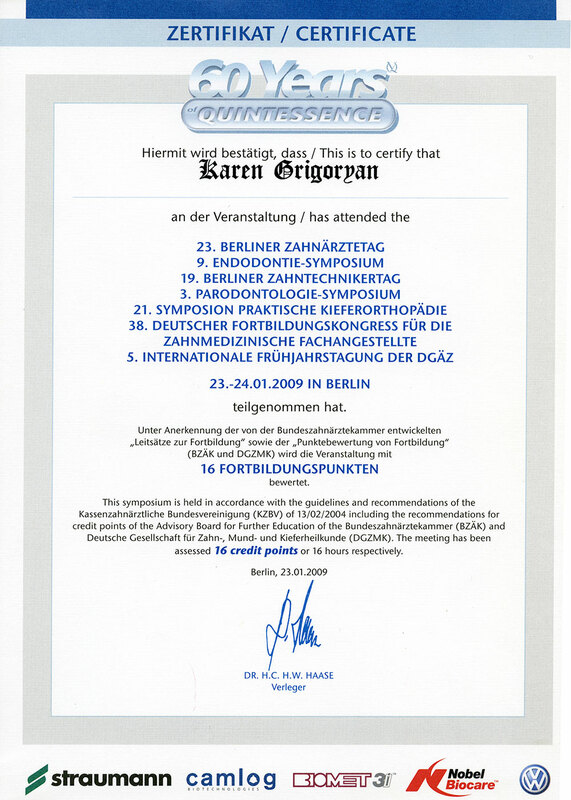 He is a scientific consultant and expert of well known German company ImPlaza. 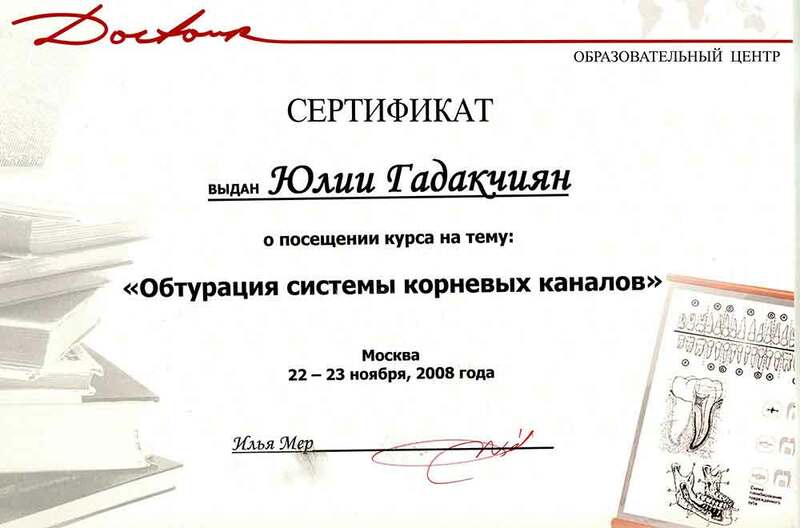 -2006, Moscow, Educational Center «Doktur»  Applied endodontics 1st and 2nd courses. 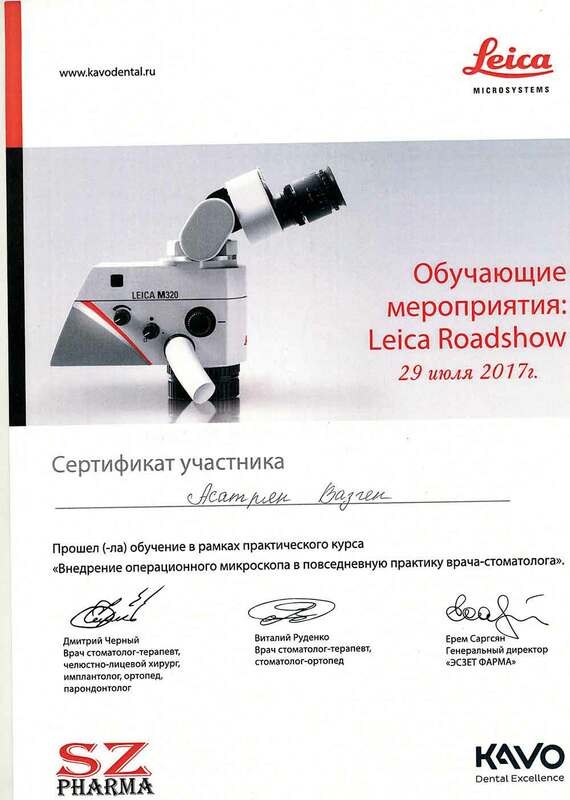 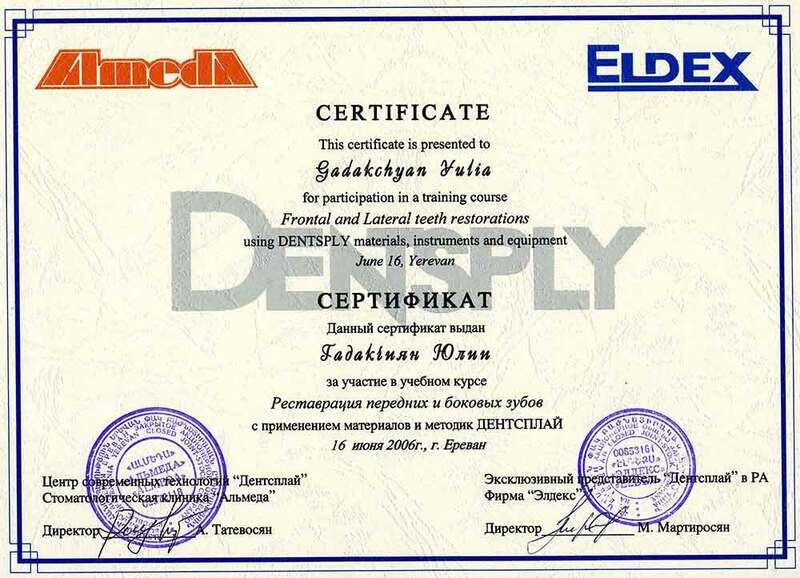 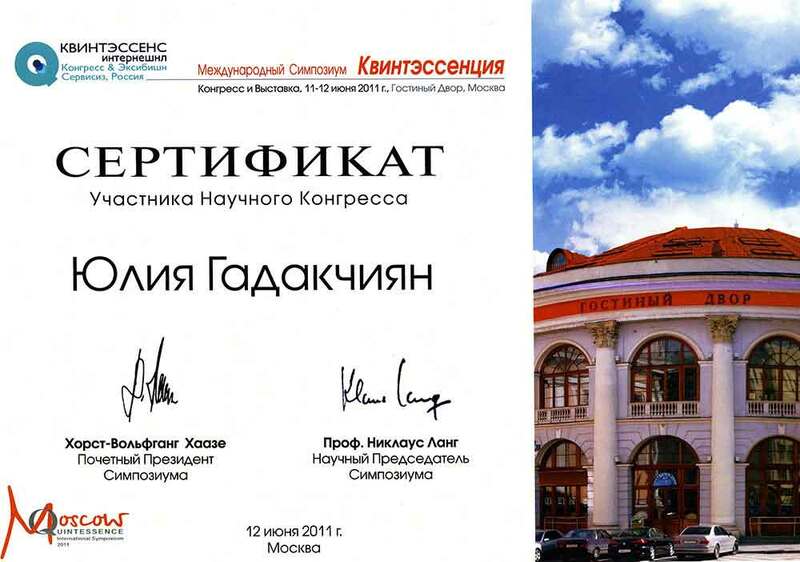 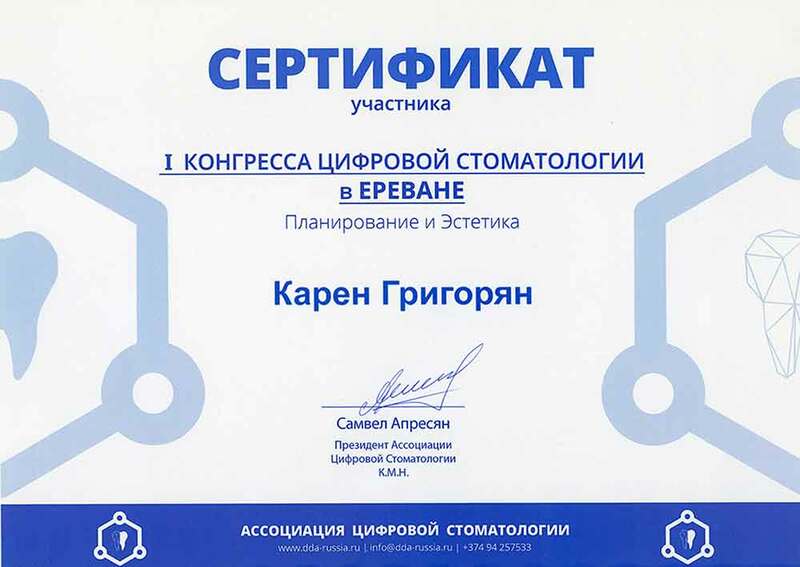 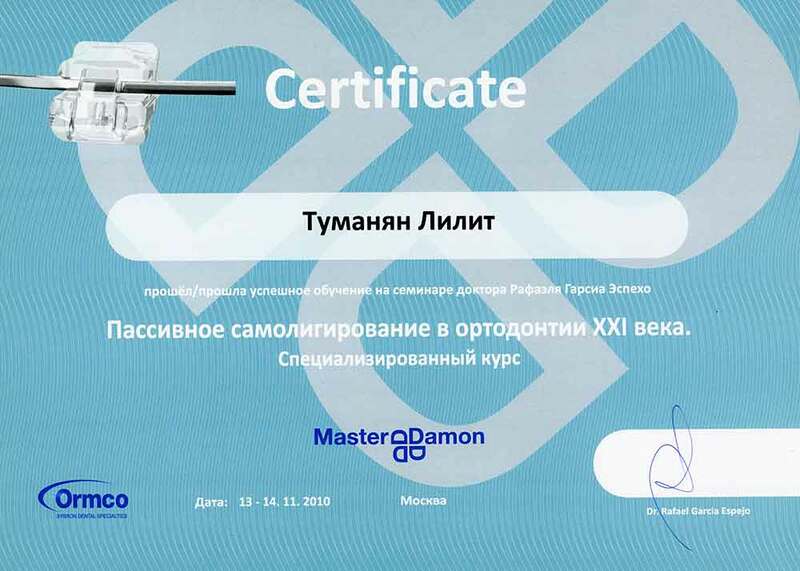 -2006, Moscow,  Phantom course on the technologies and materials of «Dentsply International». 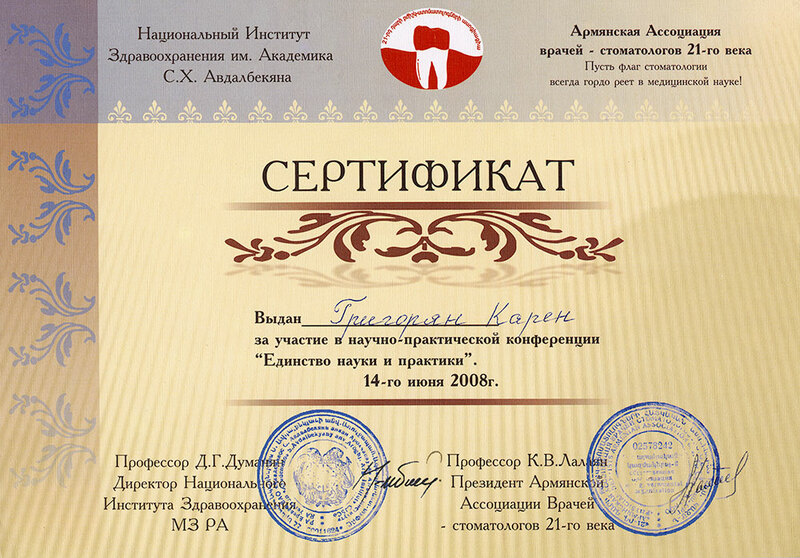 Resin-bonded bridges of frontal and lateral teeth. 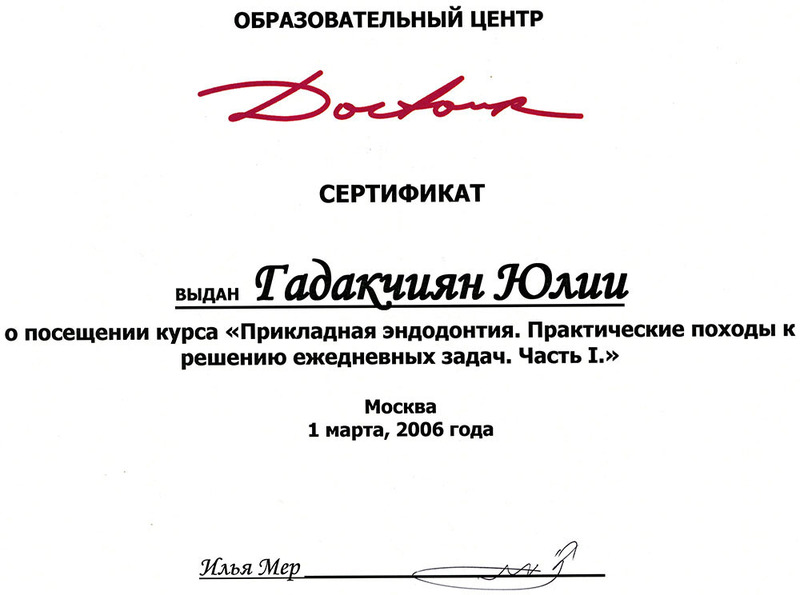 -2006, Moscow, Root canal obturation. 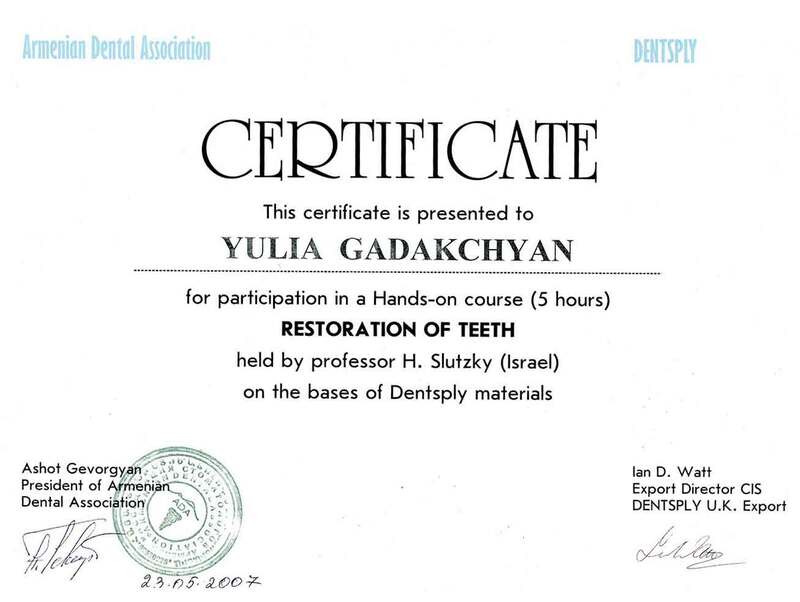 -2007, Israel,  Restoration of teeth by Pr. 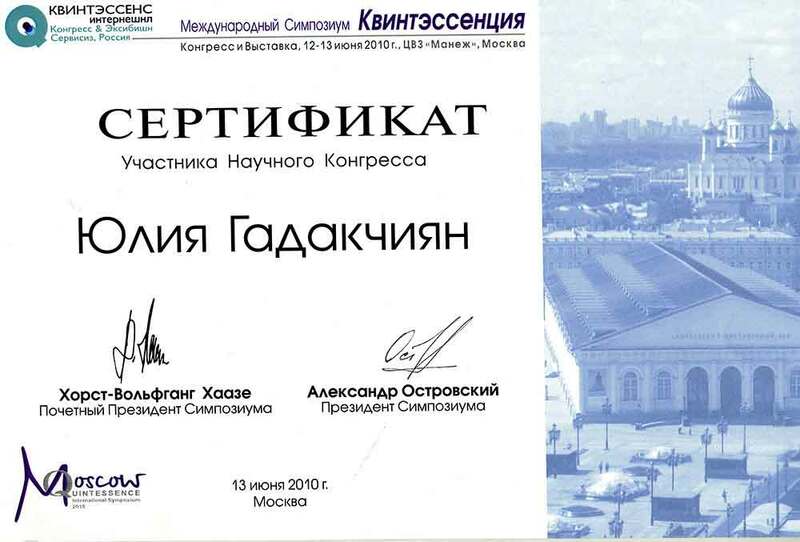 Slutzky. 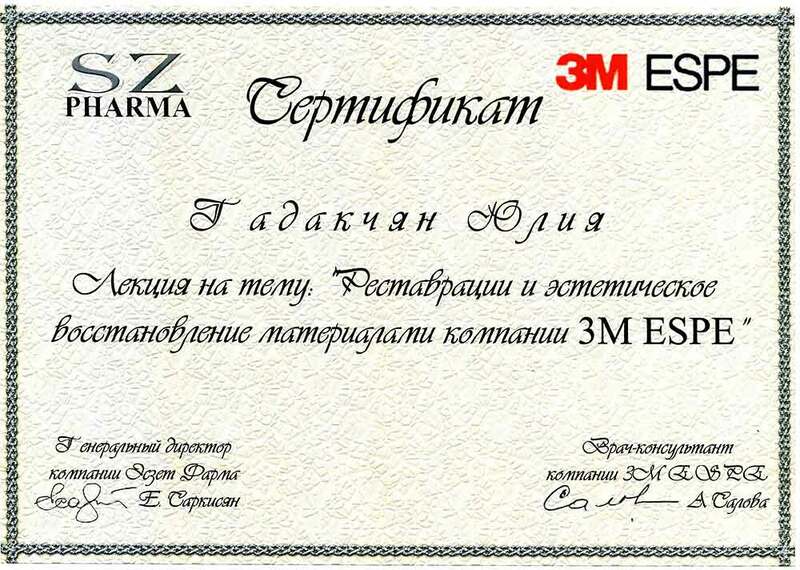 -2007, Saint Petersburg,  The peculiarities of esthetic restoration-3M, E.S’PE. 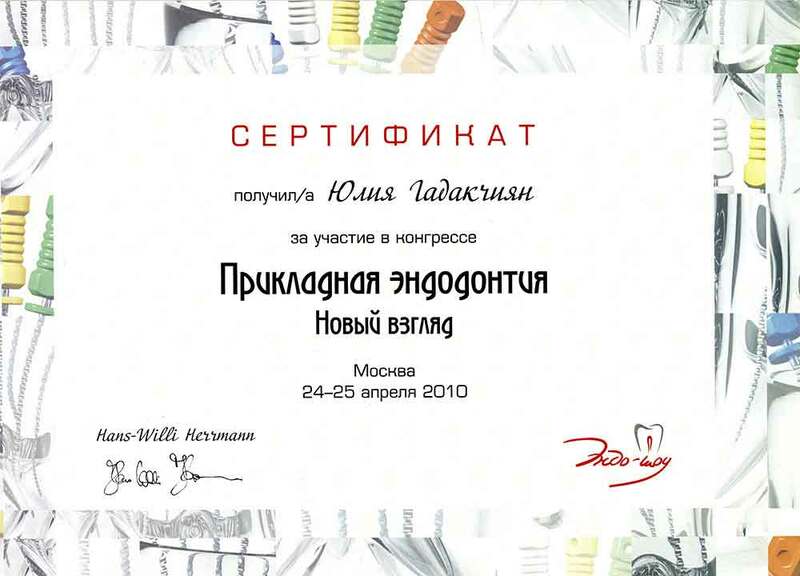 -2007 , Rostov-on-Don, estoration of frontal teeth. 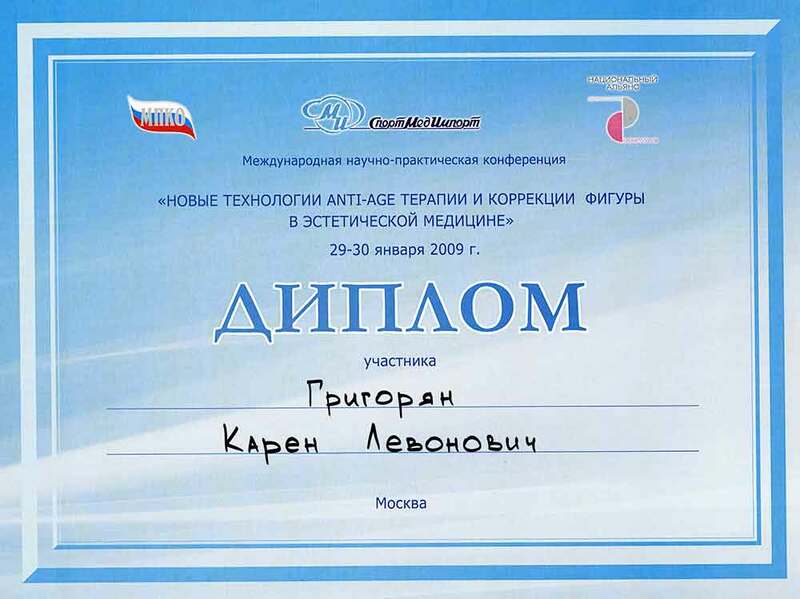 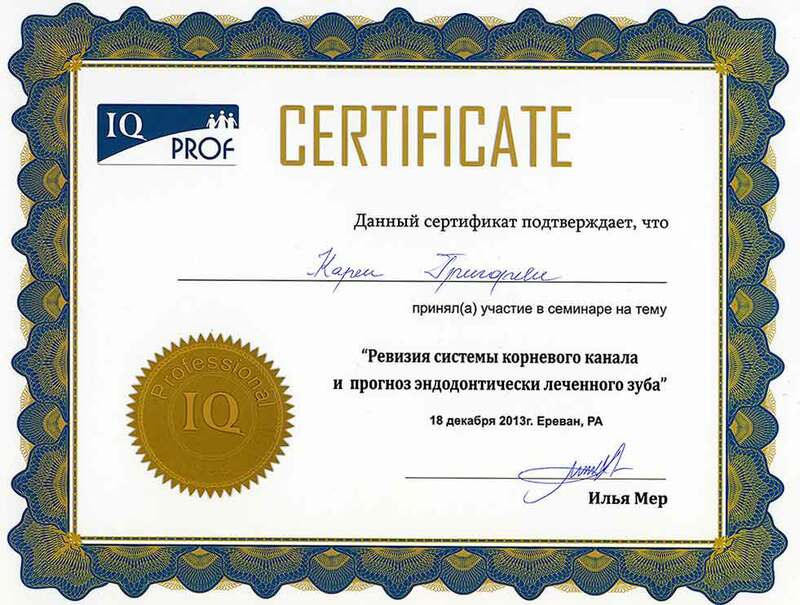 -2009 2010, 2011,  Moscow, Scientific Congress Quintessence. 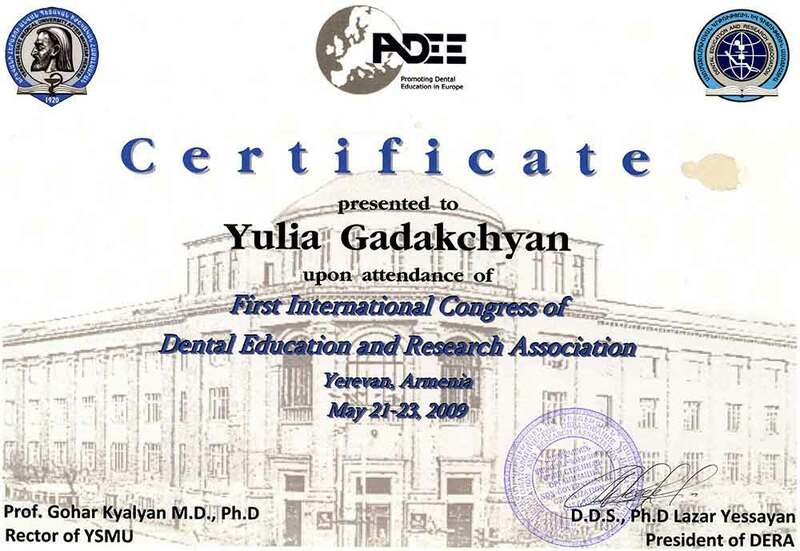 -2010, Yerevan, Seminar Dental Implantation. 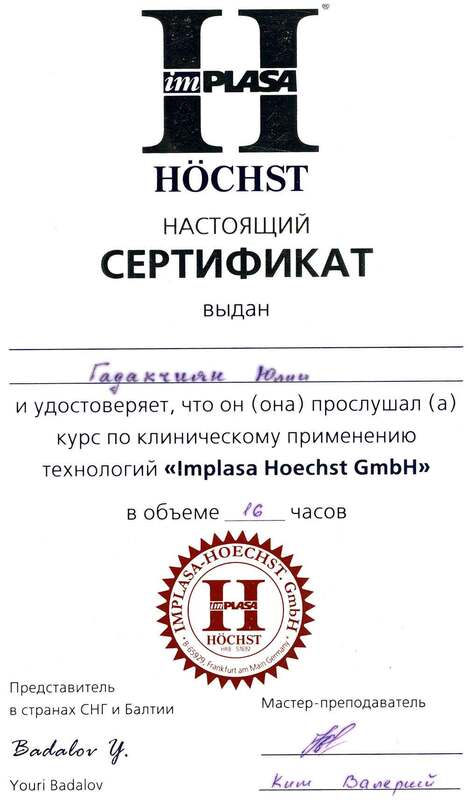 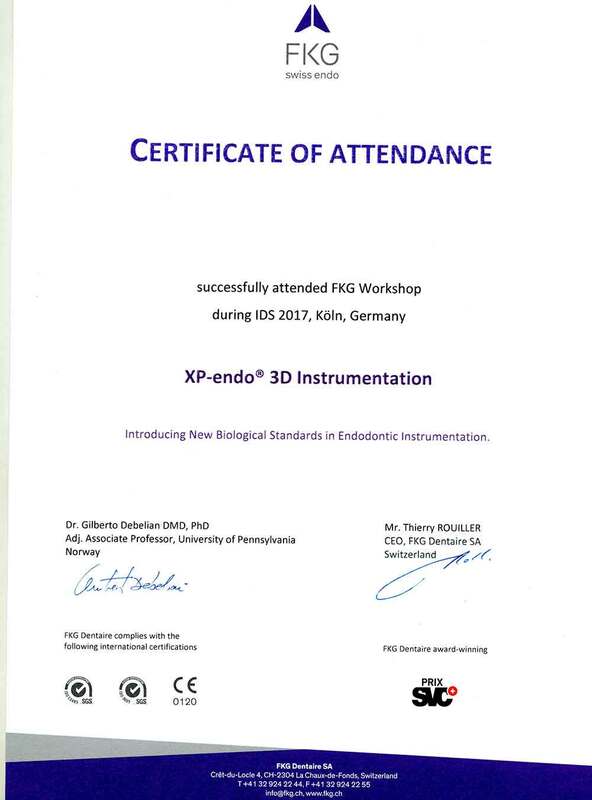 A course on clinical appliance of  ”Implasa Hoechst GmbH” technologies. 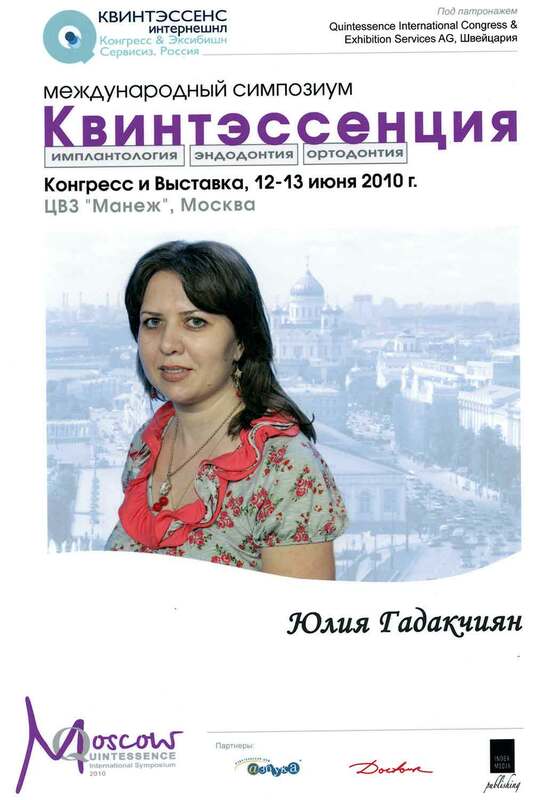 - 2010, Moscow, Conferences and seminars of Colgate, SybronEndo,etc. 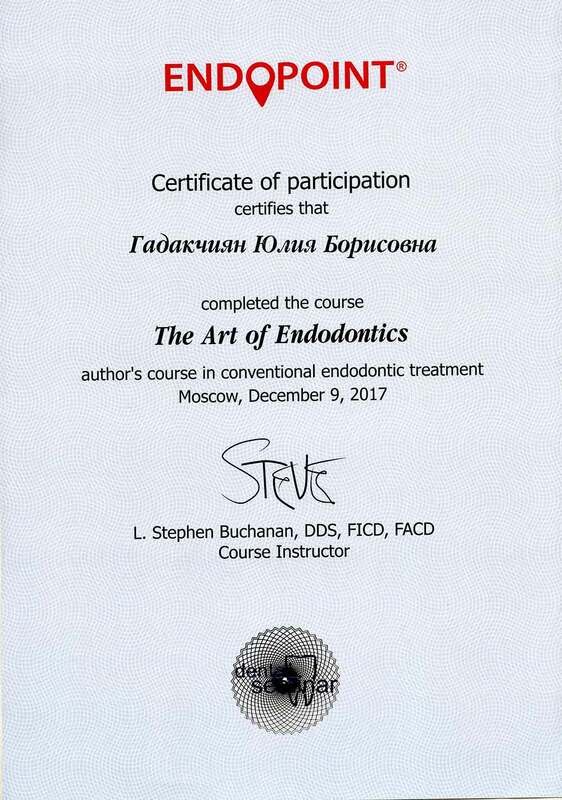 -2010,  A new look at endodontics. 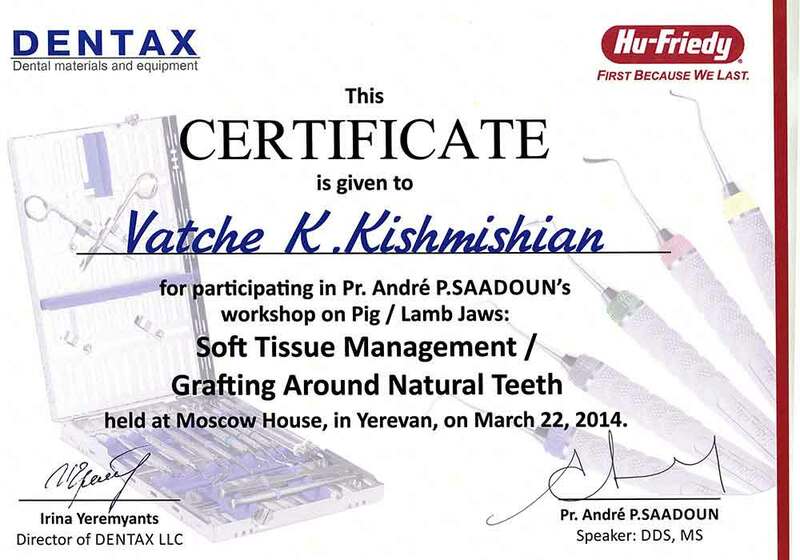 Combined method of tooth canal filling. 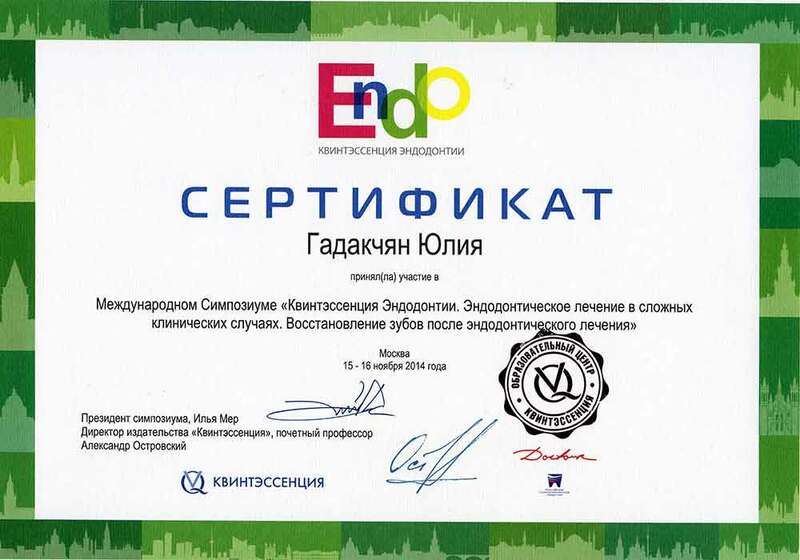 -2014,  Moscow,  International Symposium «Quintessence of Еndodontics. 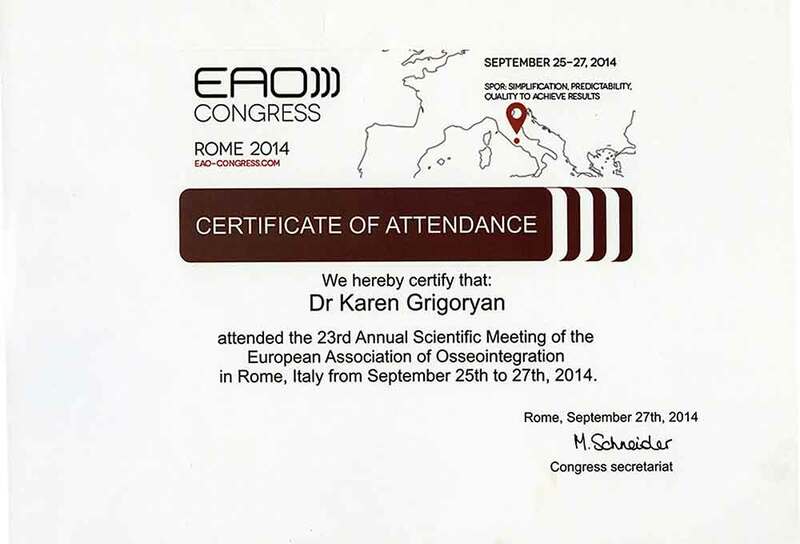 Еndodontic treatment in complicated clinical cases. 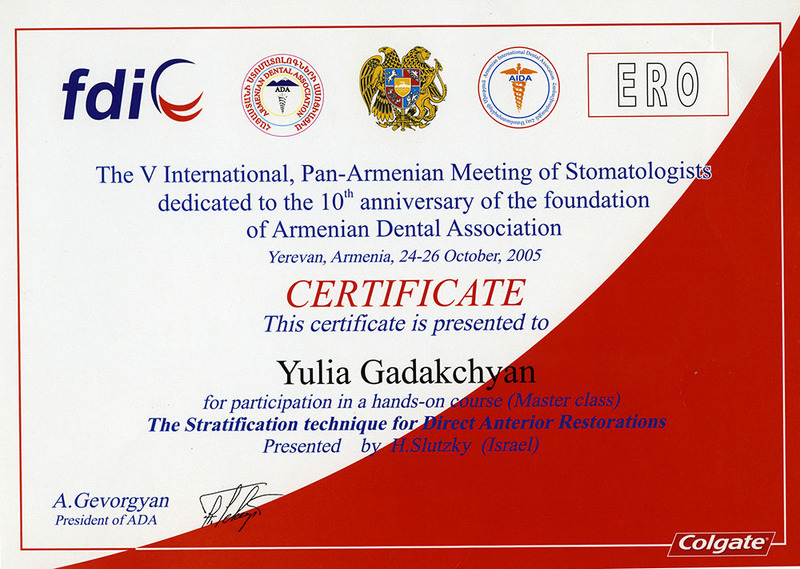 Teeth restoration after endodontic treatment. 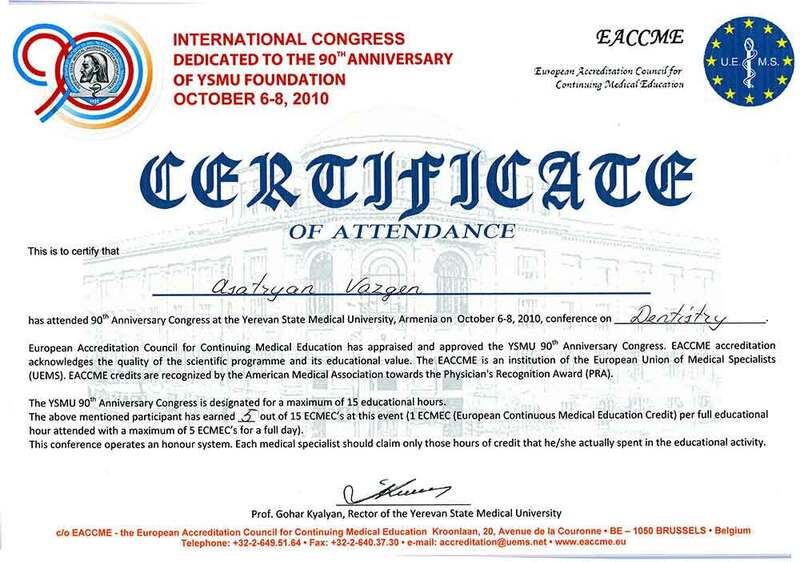 President of Symposium Ilya Mer. 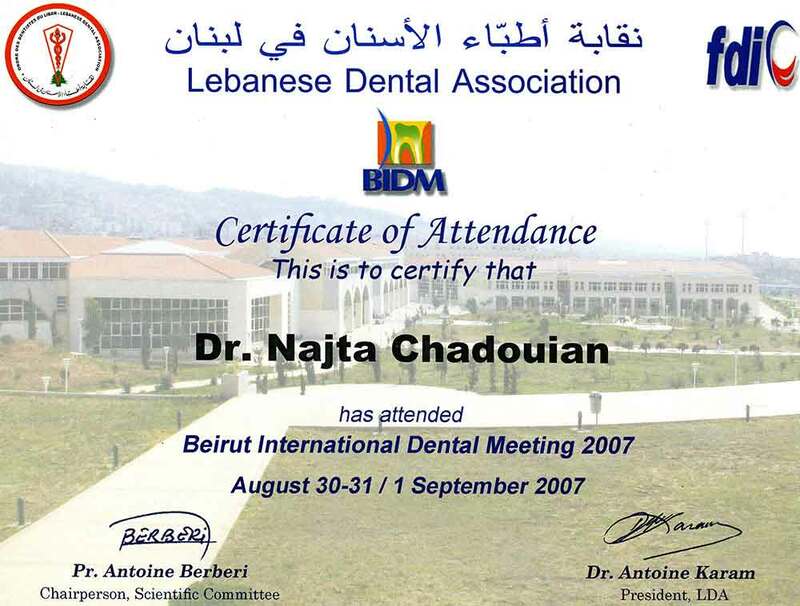 - 2002 Lebanon, Lebanese Dental Association 12th Annual Convention. 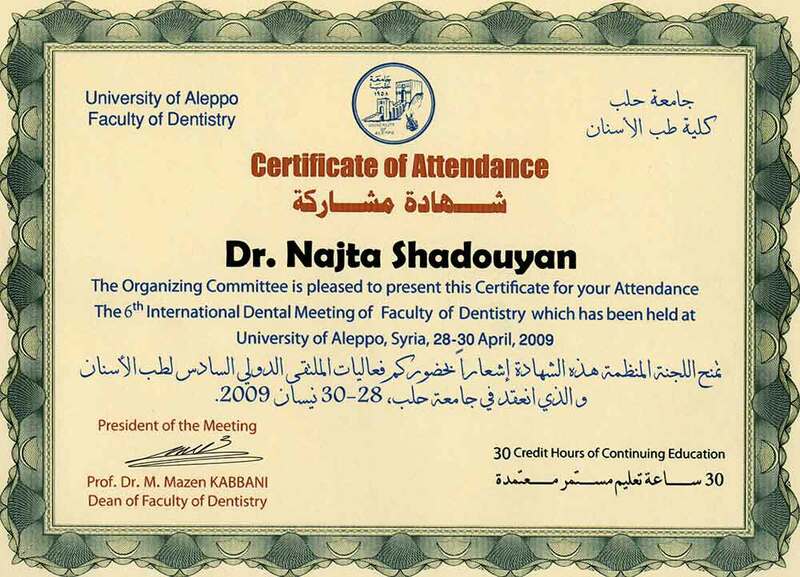 - 2002 Aleppo, 5th international scientific dental meeting. 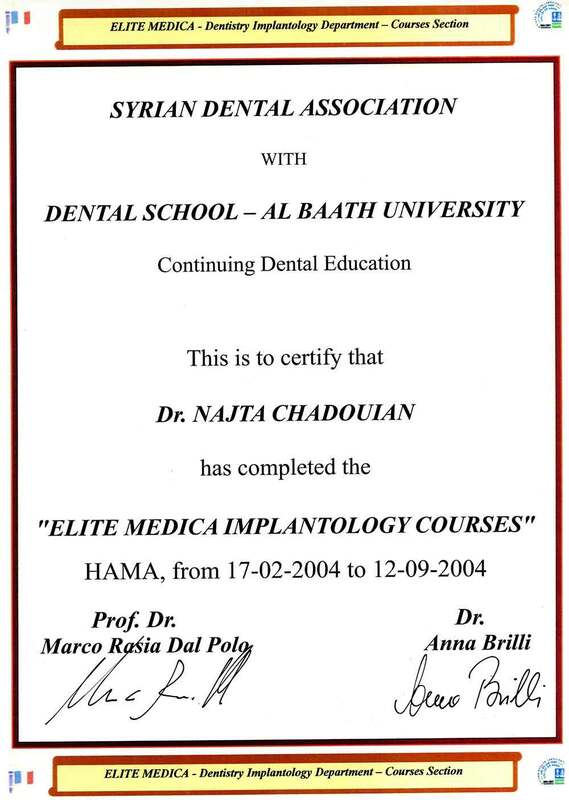 - 2002 Aleppo, Beirut International Dental Meeting. 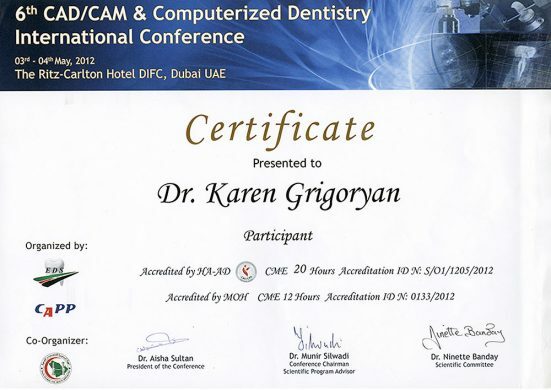 - 2003 Lebanon, Lebanese Dental Association 13th Annual Convention. 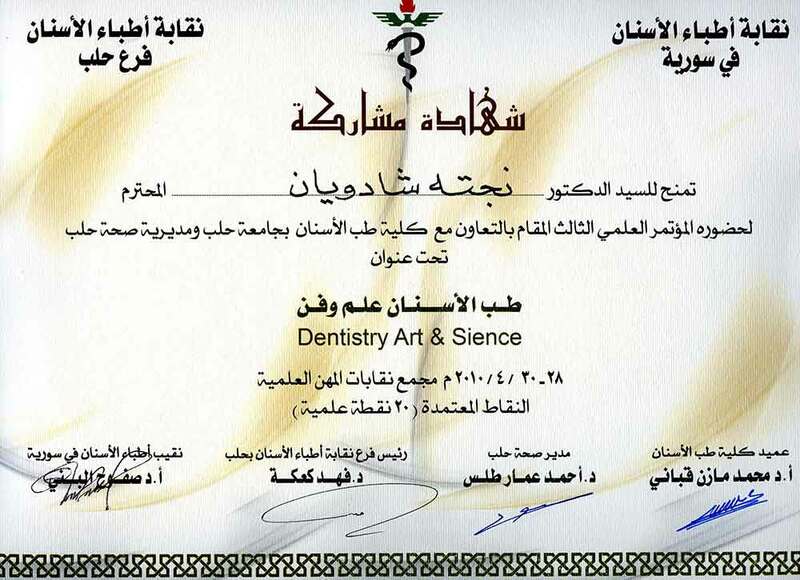 - 2003 Lebanon, Syrian Dental Association 14th Scientific Congress. 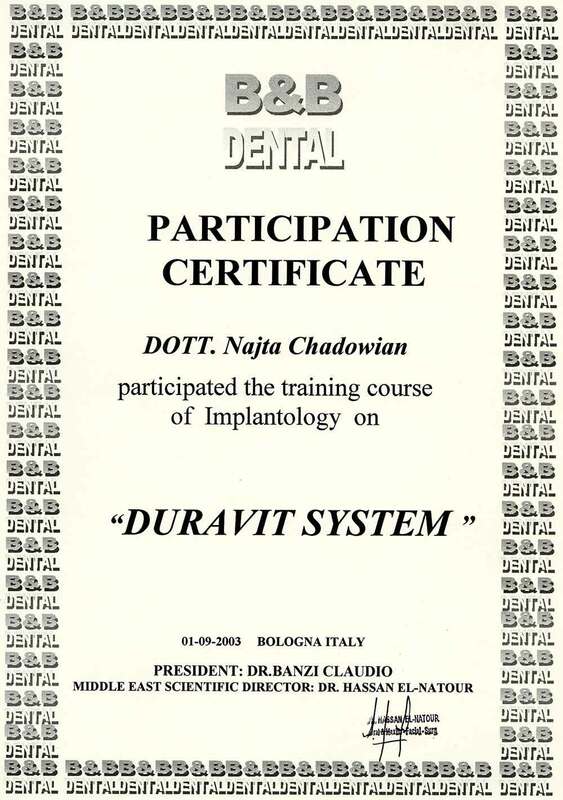 - 2003 Beirut-Lebanon, One day course on Duravit Dental Implant System. 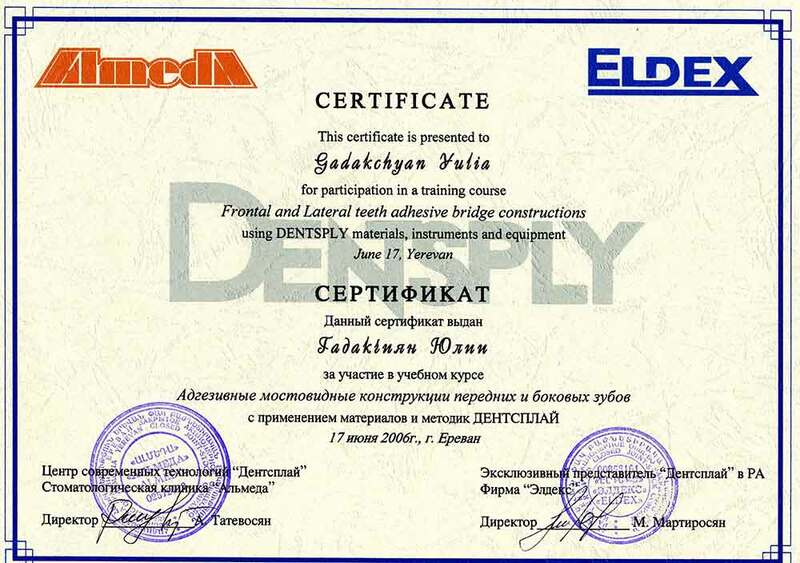 - 2003 Damascus, Dental Therapeutics Course: Modern Methods of Restorative Dentistry and Endodontic therapy. 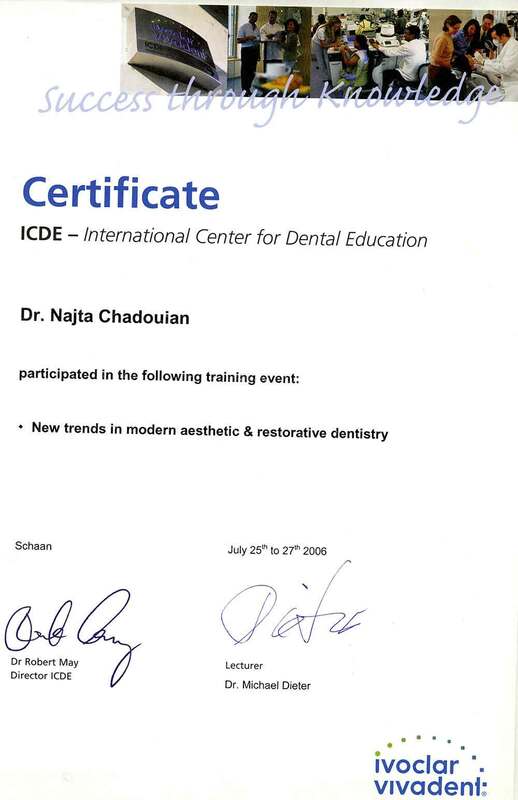 - 2004 Lebanon, Modern Aspects of Esthetic Dentistry Conference. 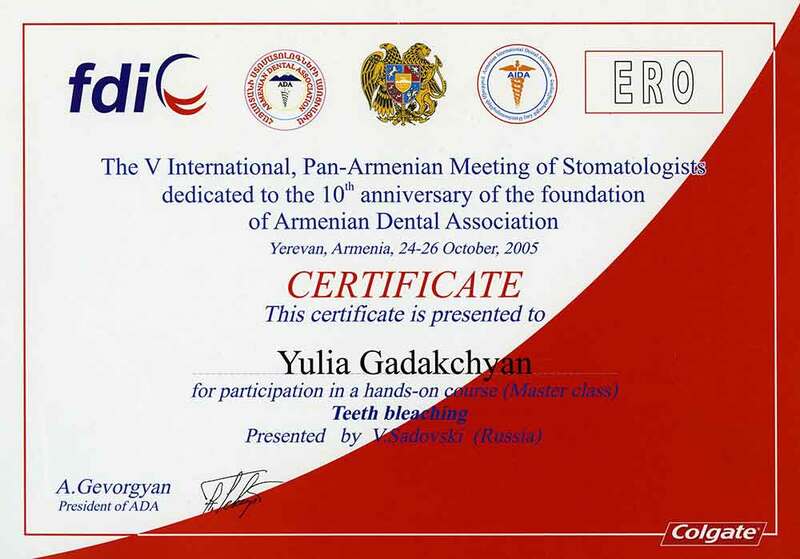 - 2004 Syri, Long-Term (Six Months) Dental Implant Course, Elite Medica Implantlogy Course. 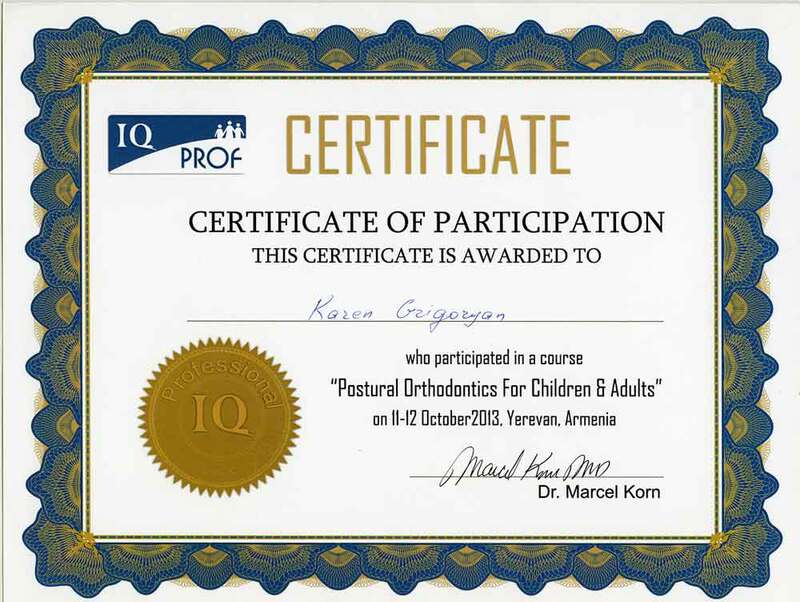 - 2006 Lebanon, 3rd conference of Syrian Prosthodontics Association. 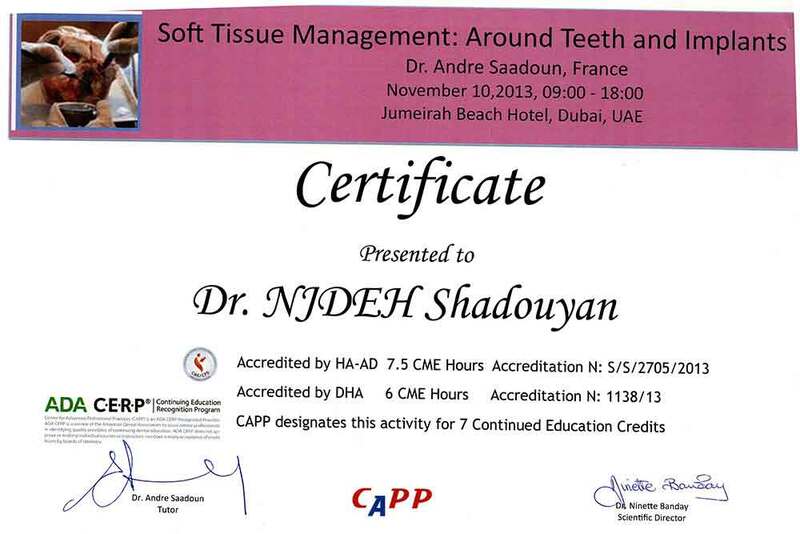 - 2013 Dubai, Soft Tissue Management Surgical Hands-on course.